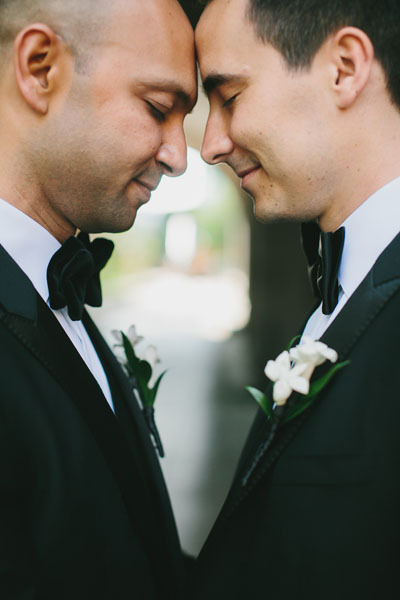 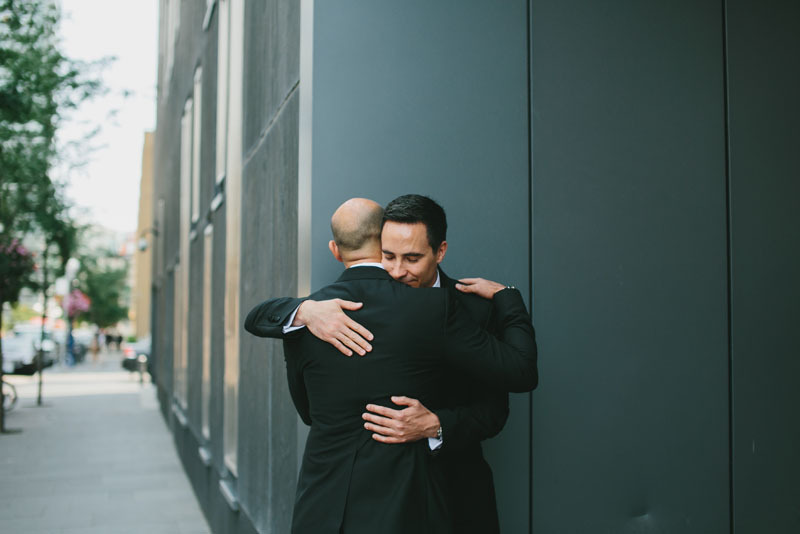 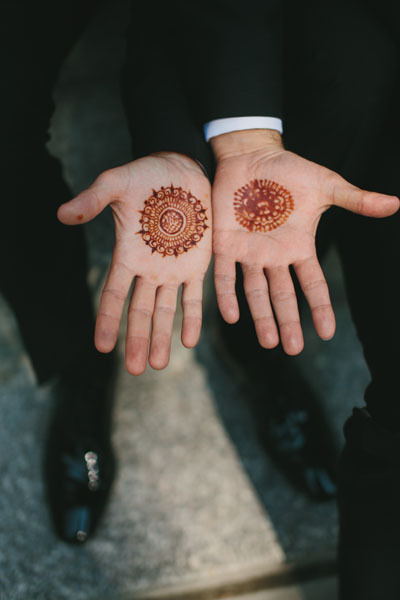 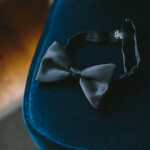 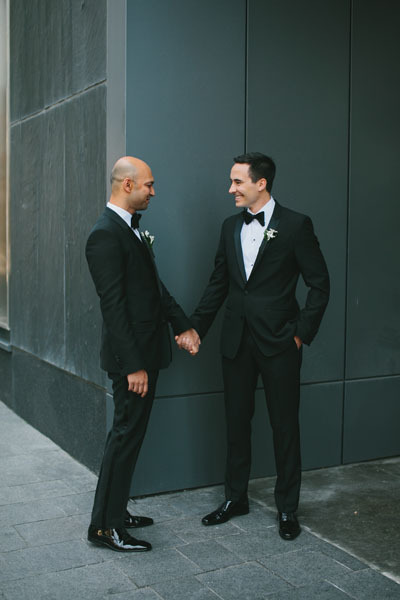 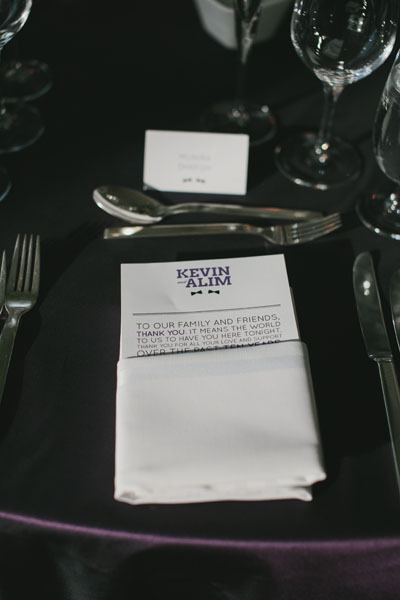 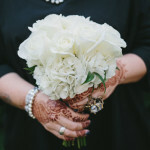 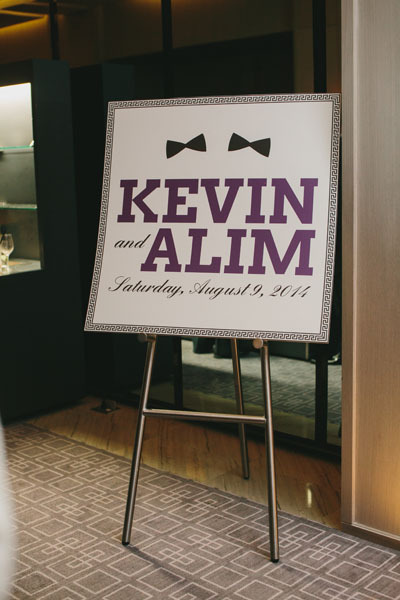 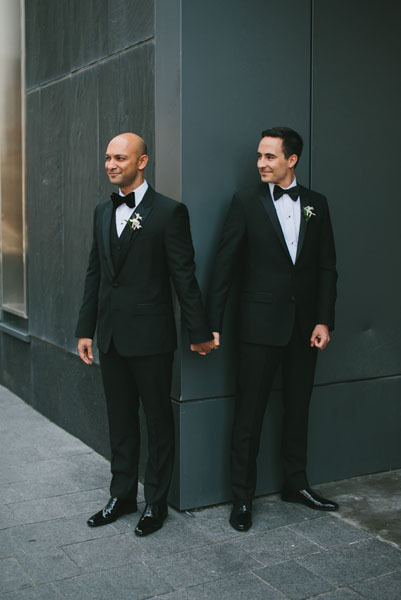 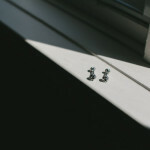 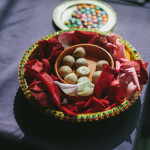 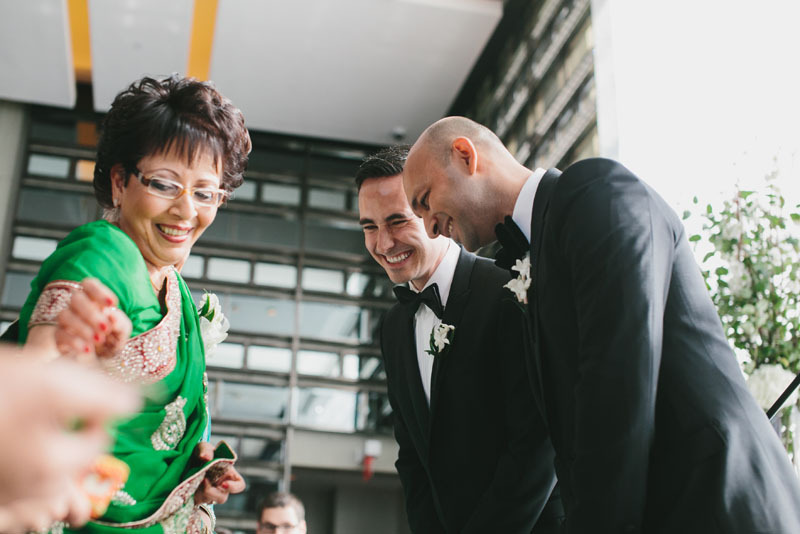 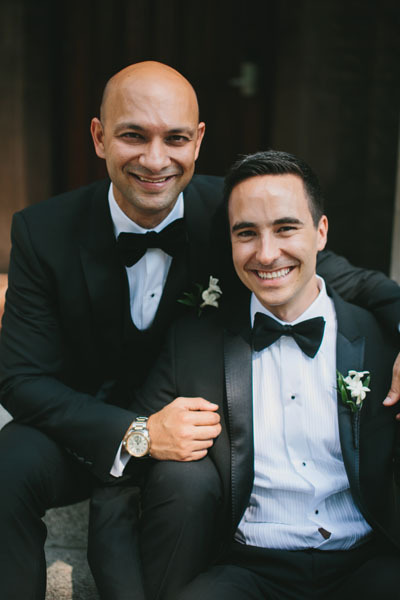 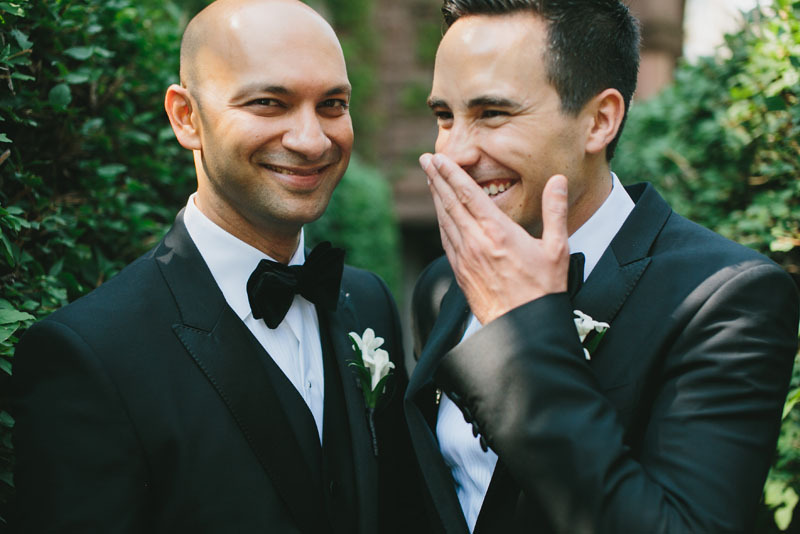 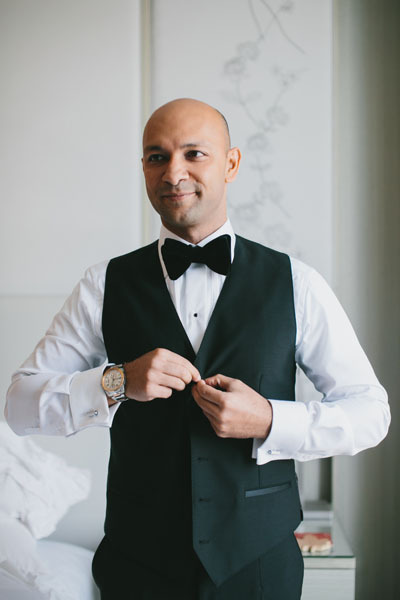 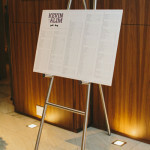 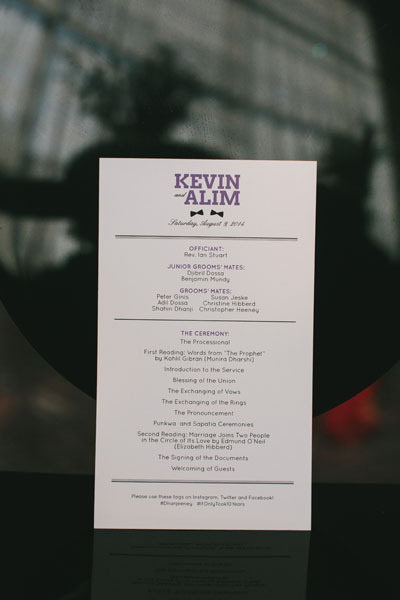 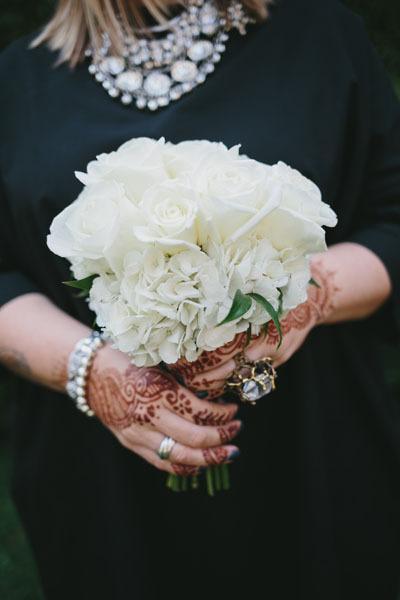 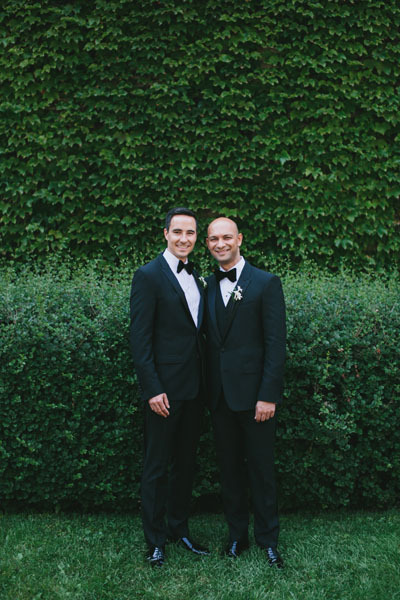 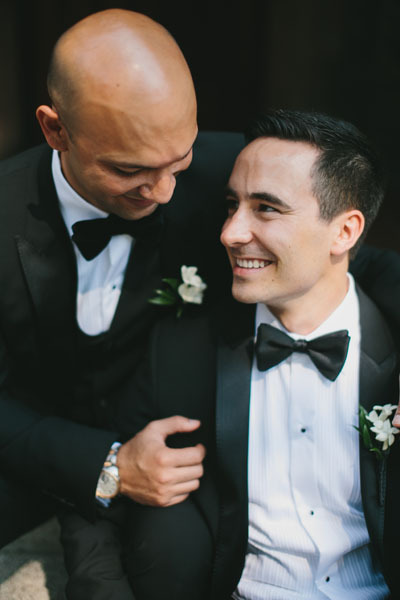 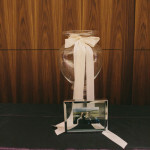 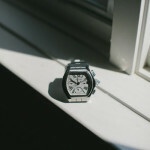 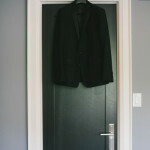 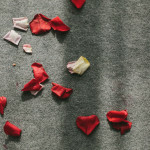 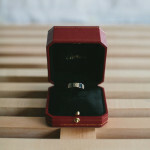 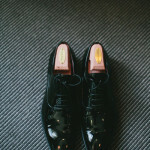 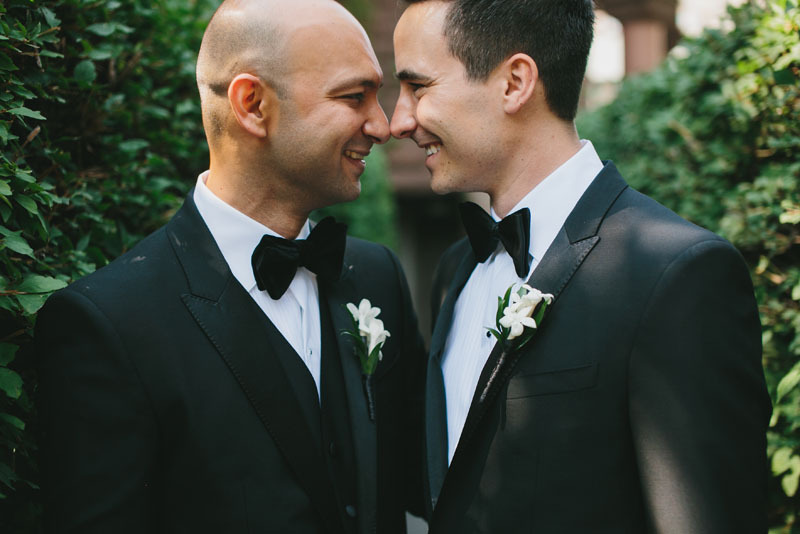 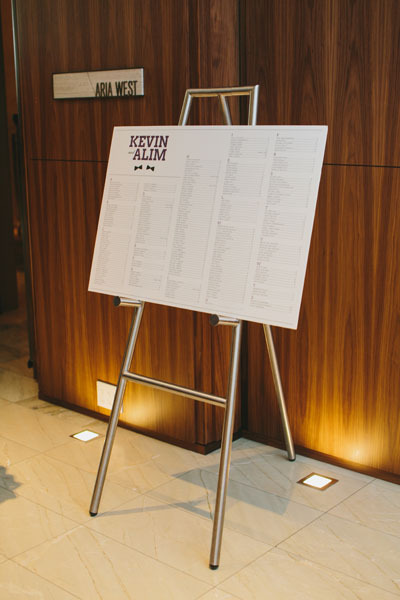 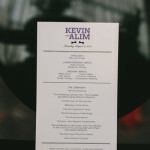 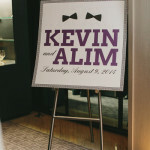 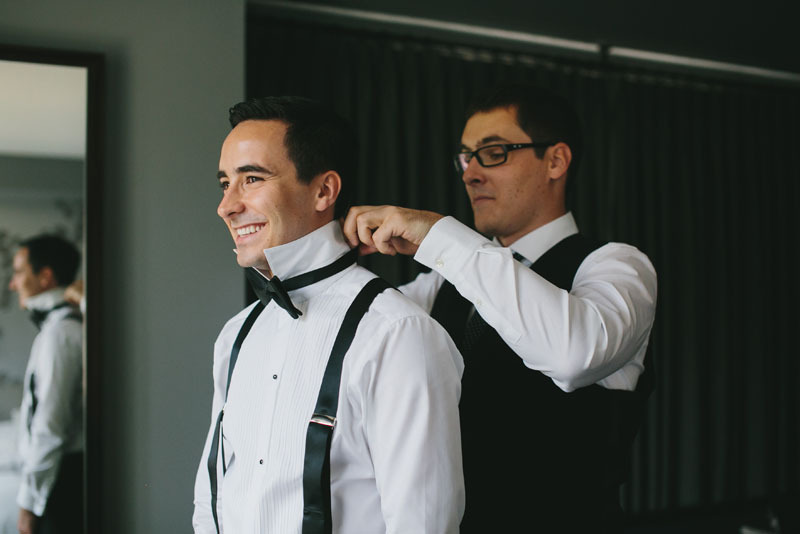 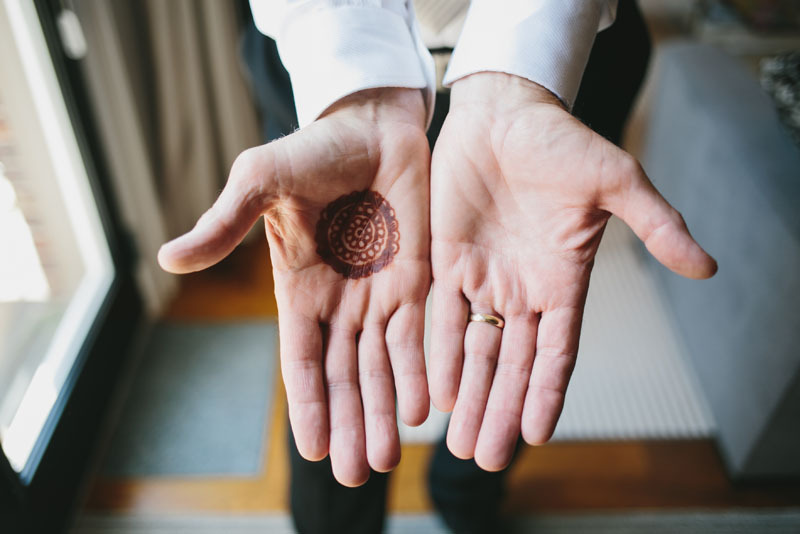 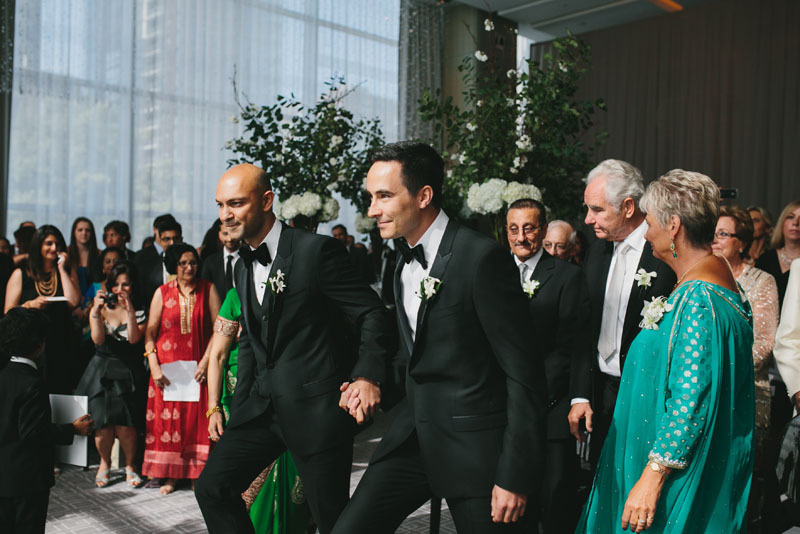 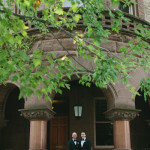 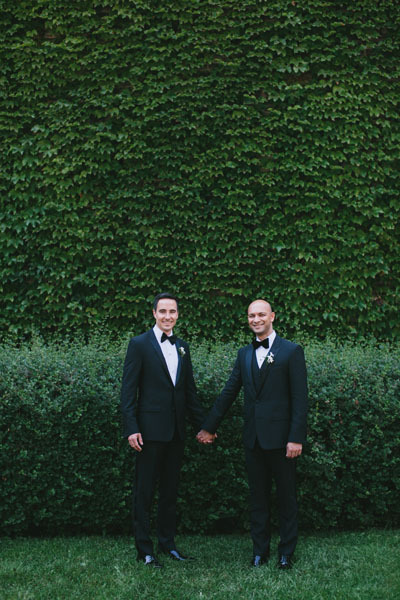 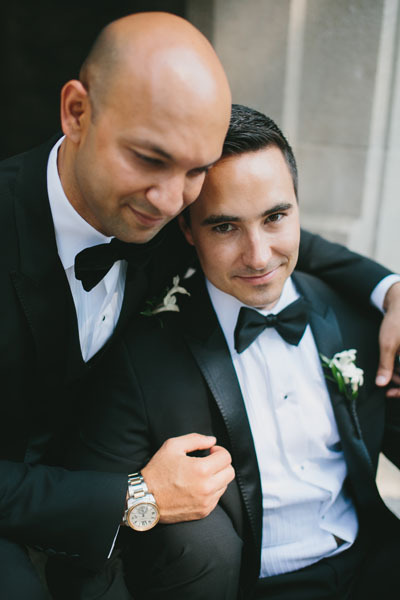 “Kevin and Alim met over a decade ago at an airport and have since traveled the world together. 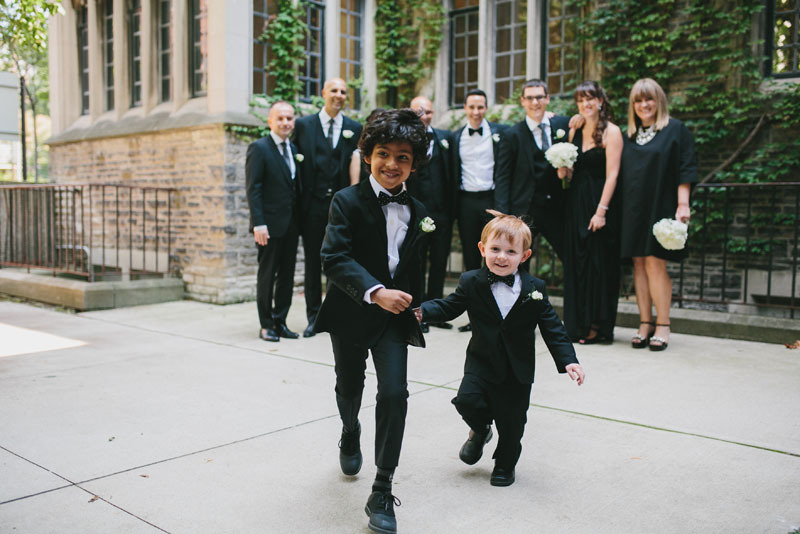 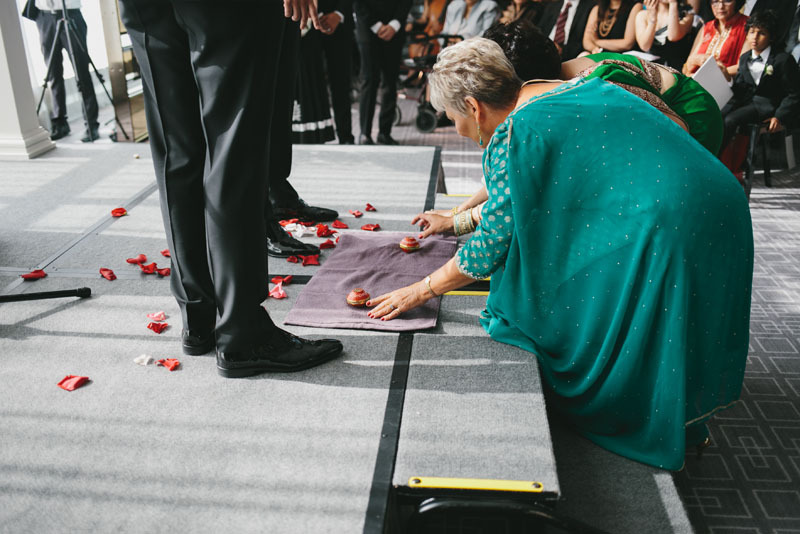 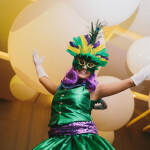 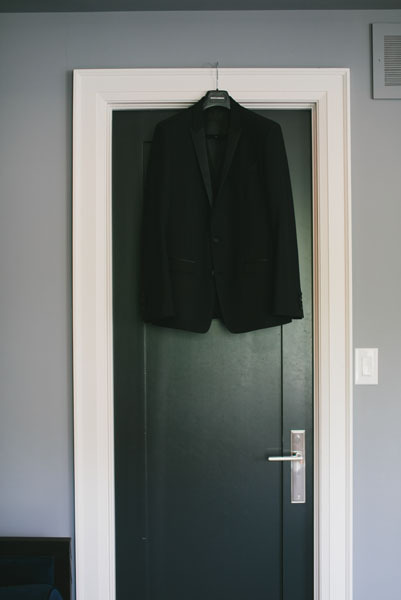 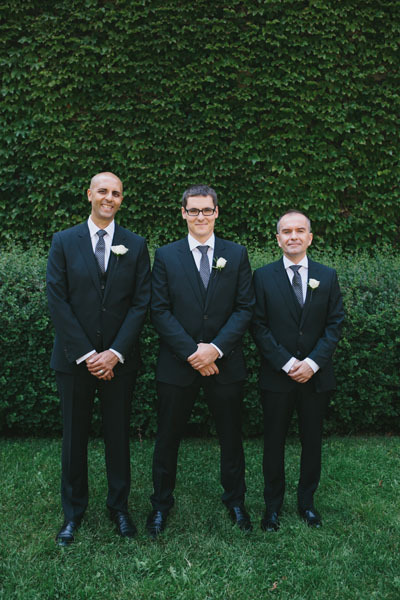 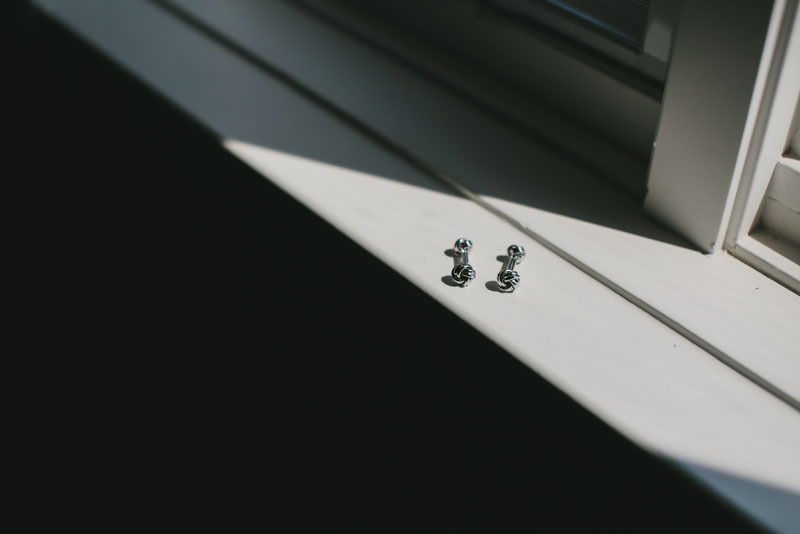 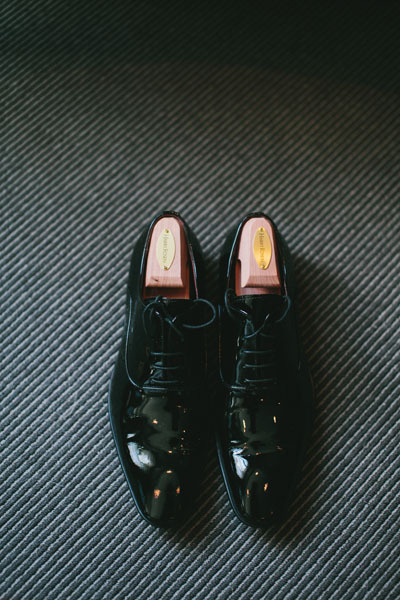 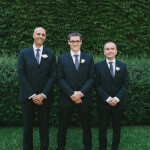 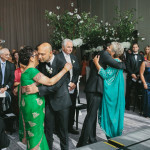 It was only suiting to get married in Toronto with 300 of their friends and family flying in from all over to celebrate with them. 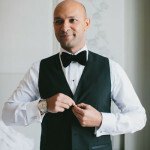 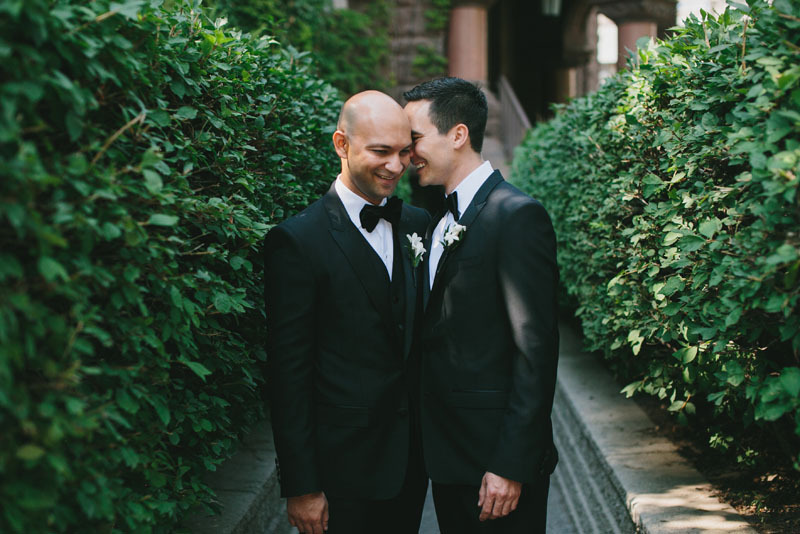 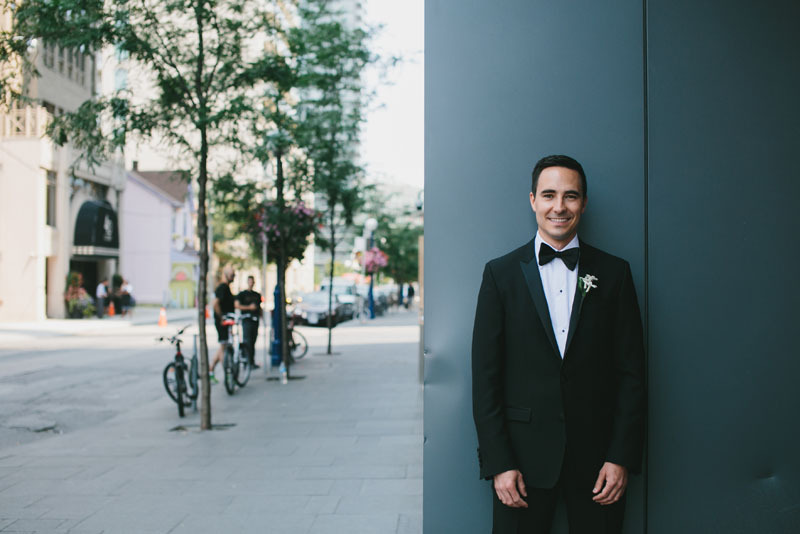 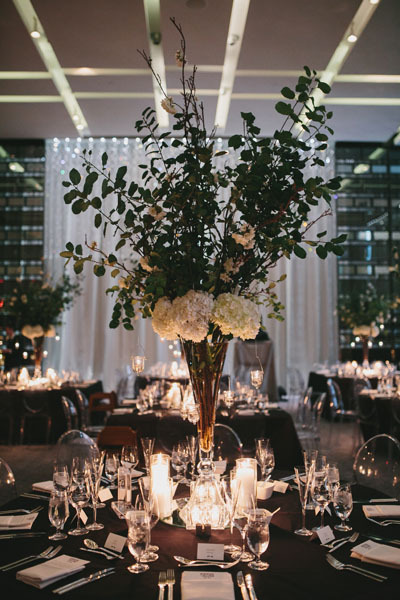 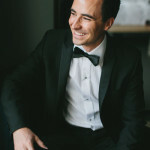 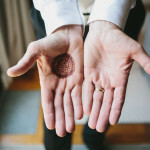 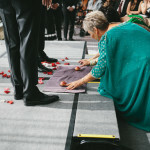 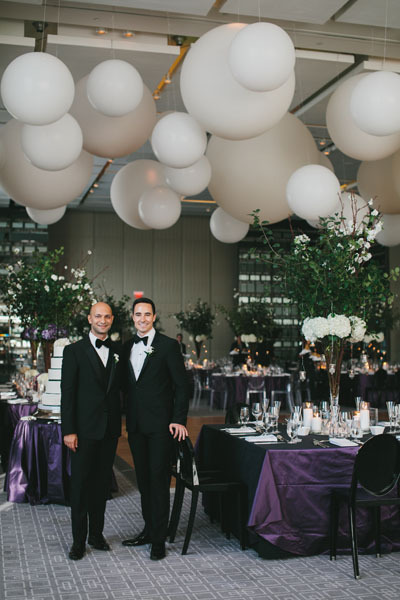 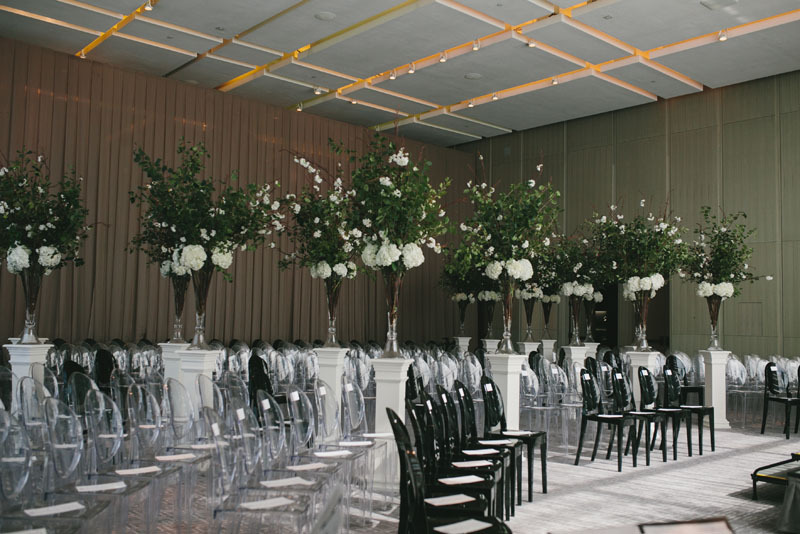 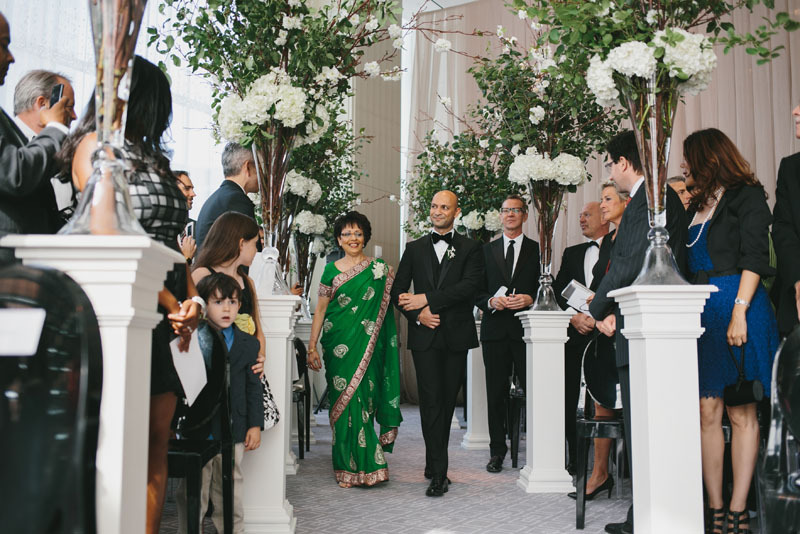 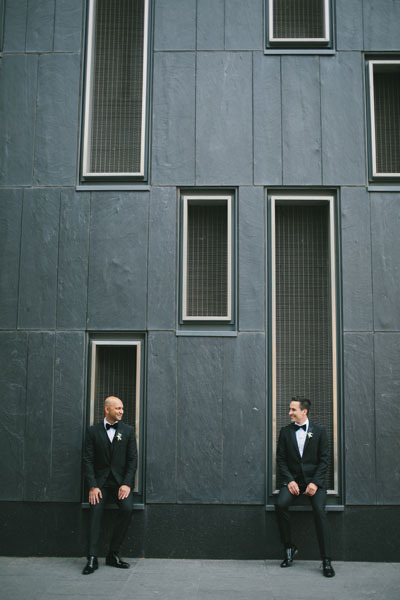 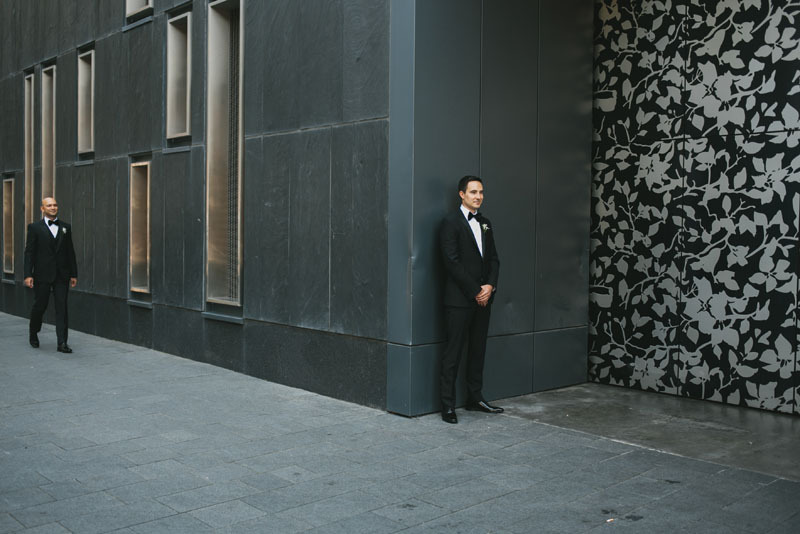 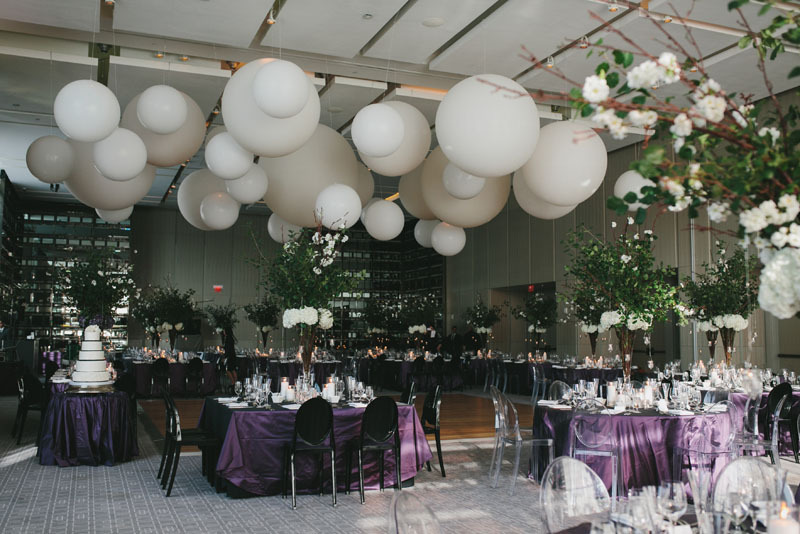 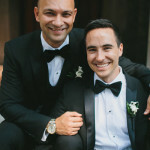 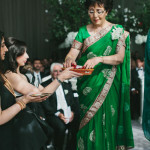 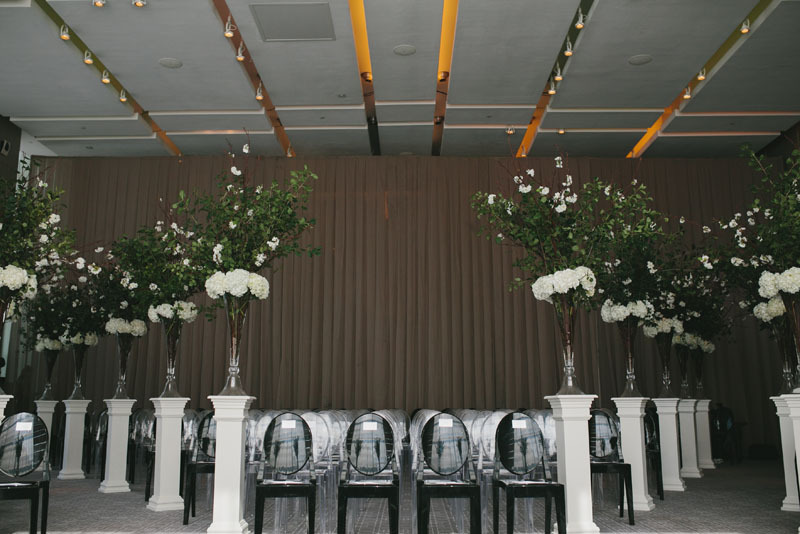 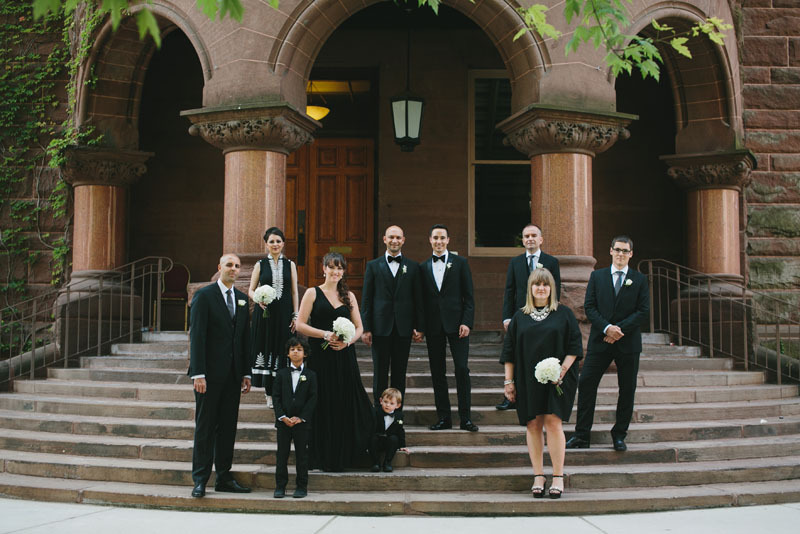 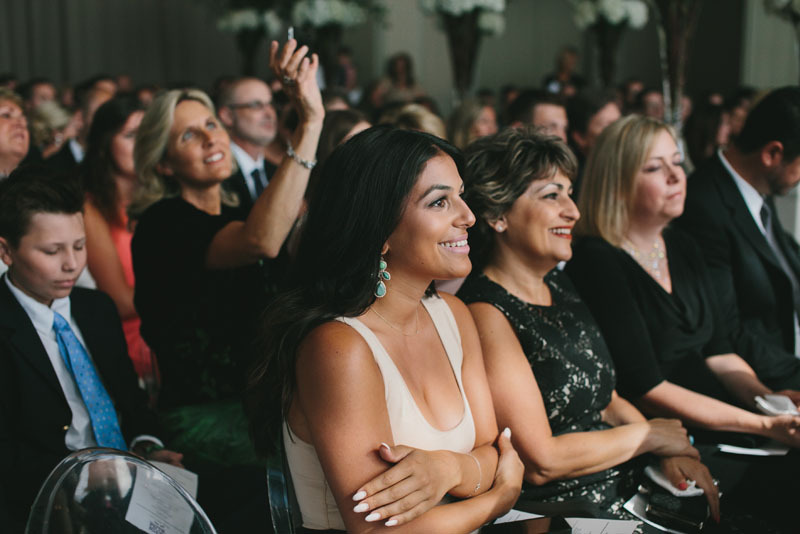 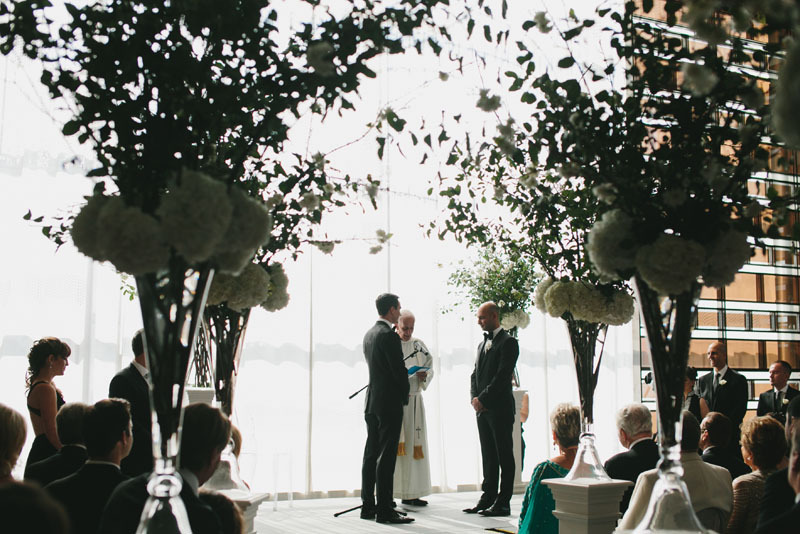 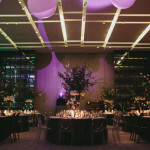 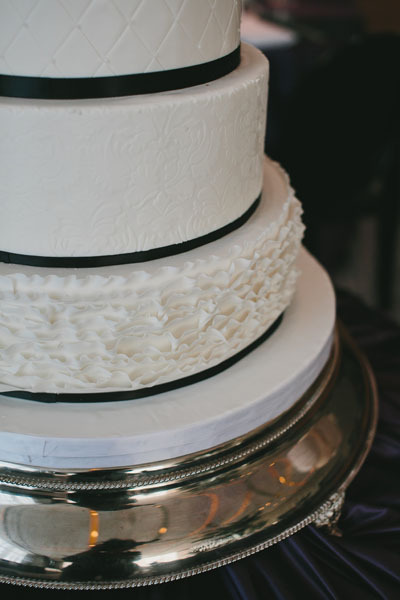 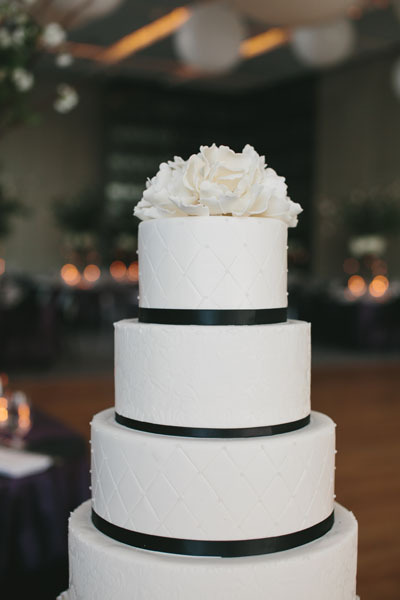 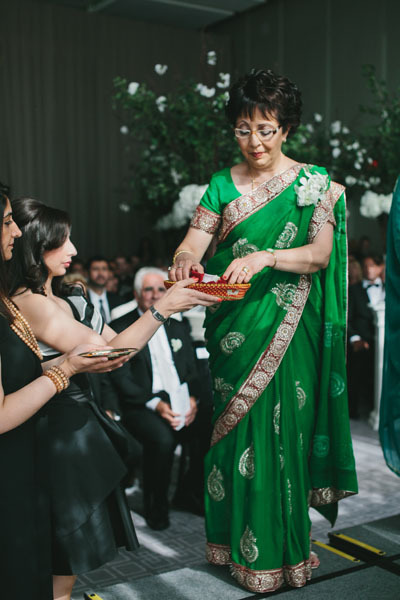 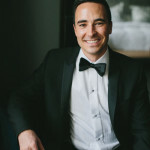 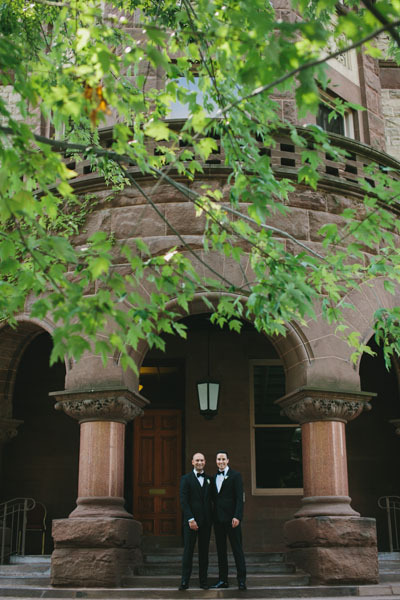 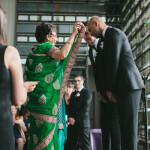 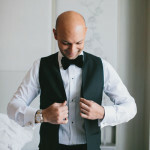 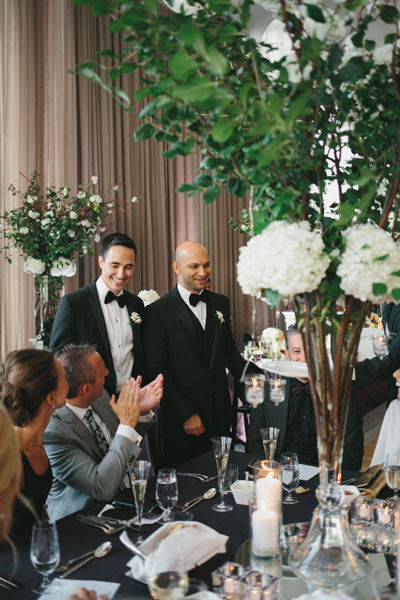 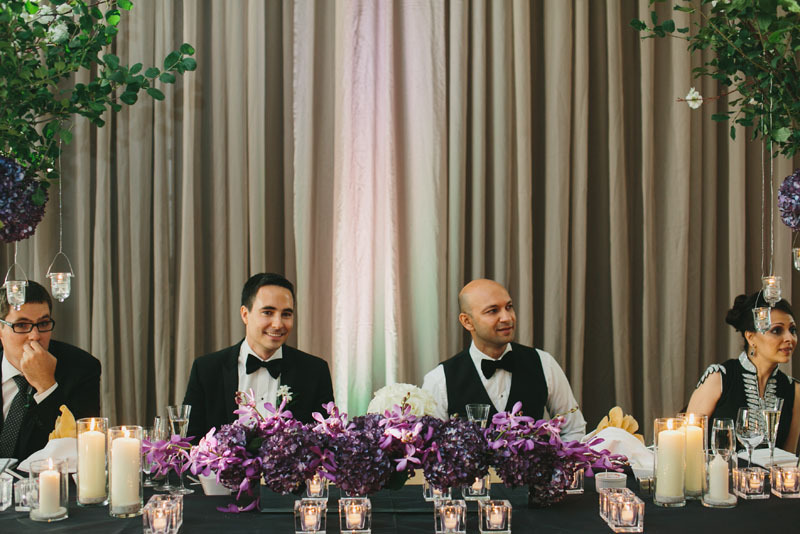 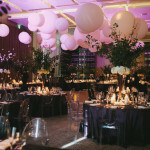 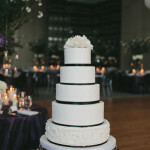 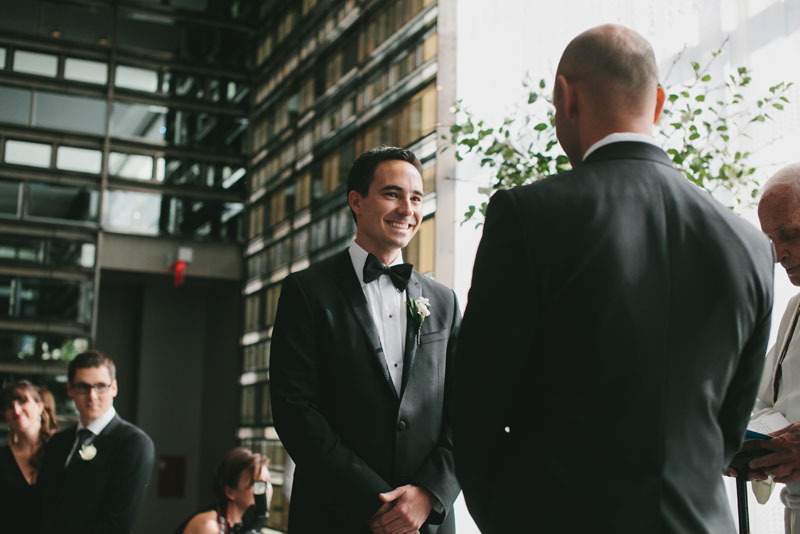 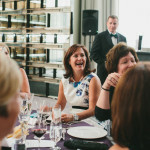 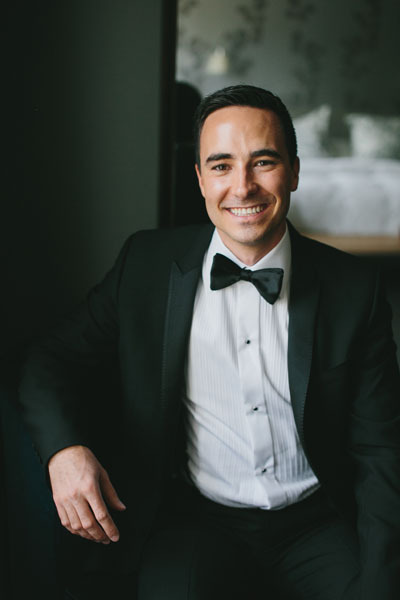 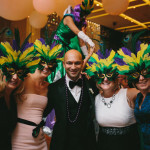 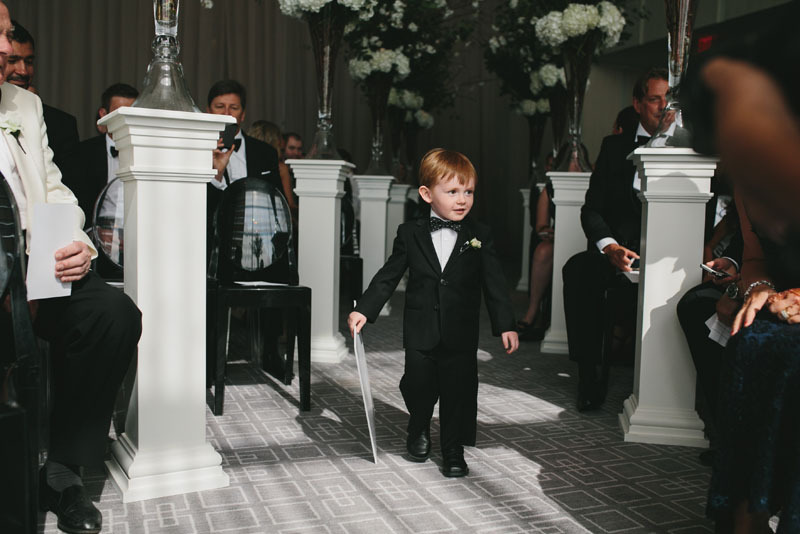 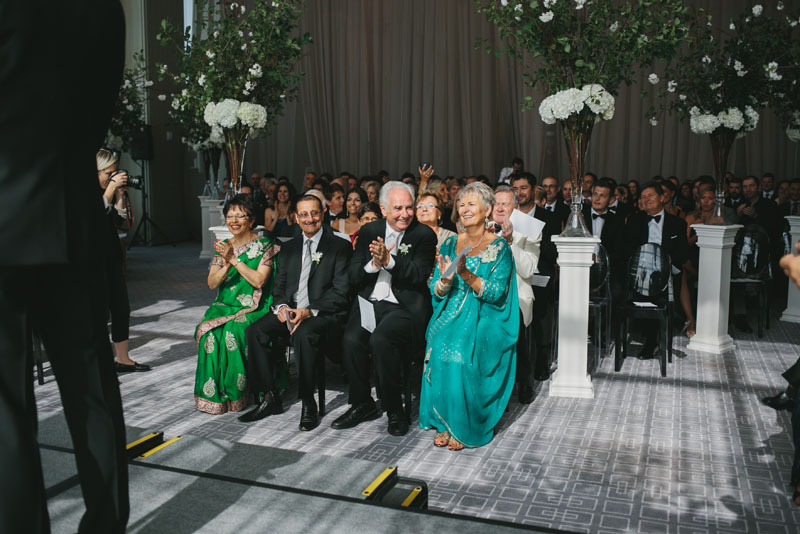 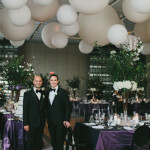 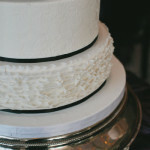 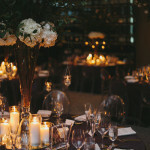 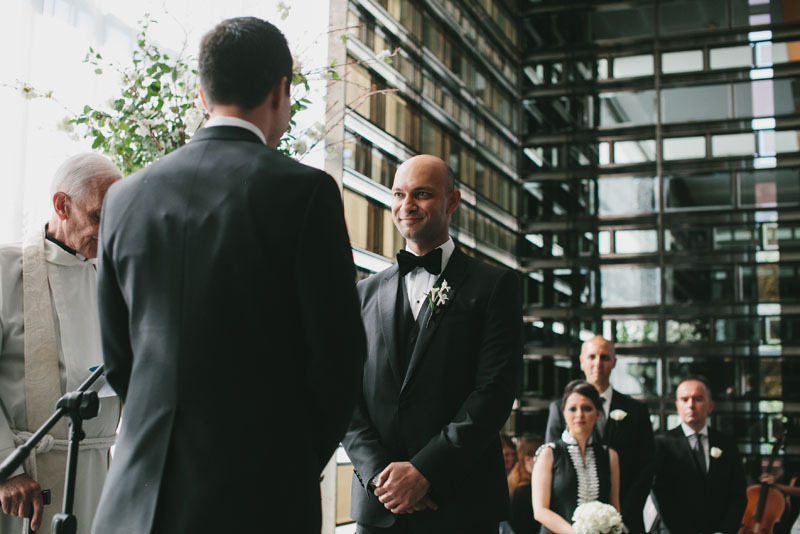 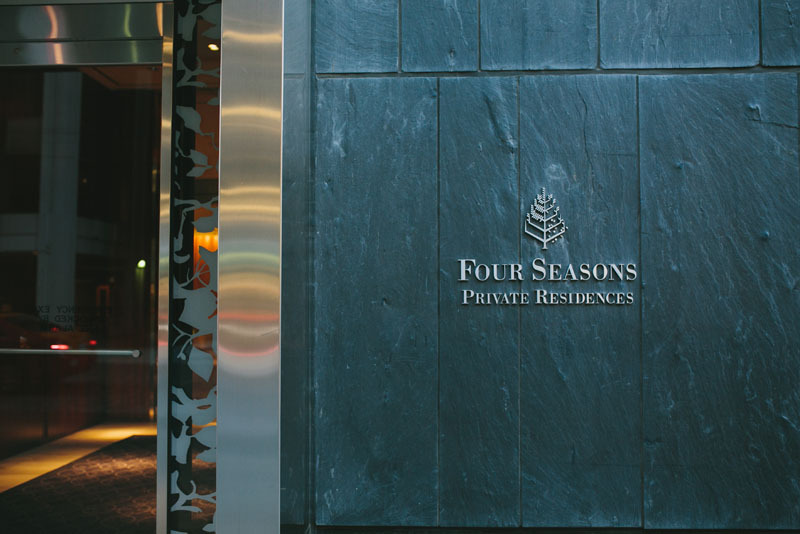 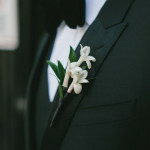 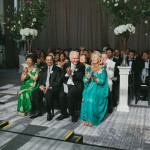 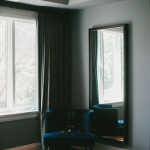 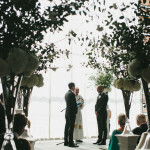 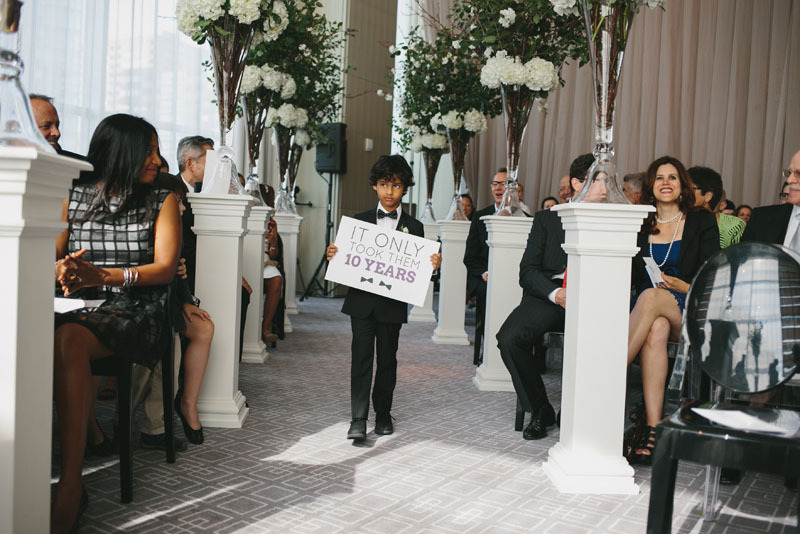 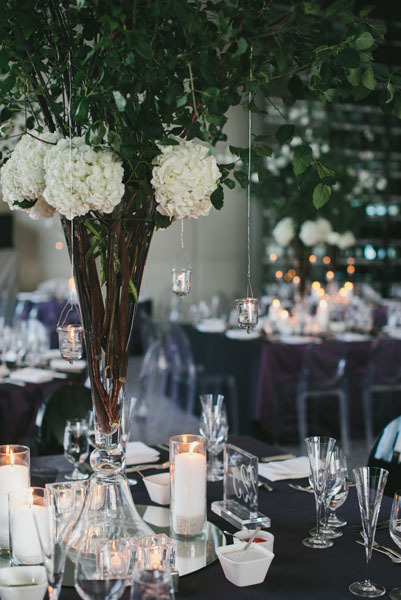 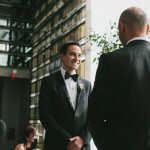 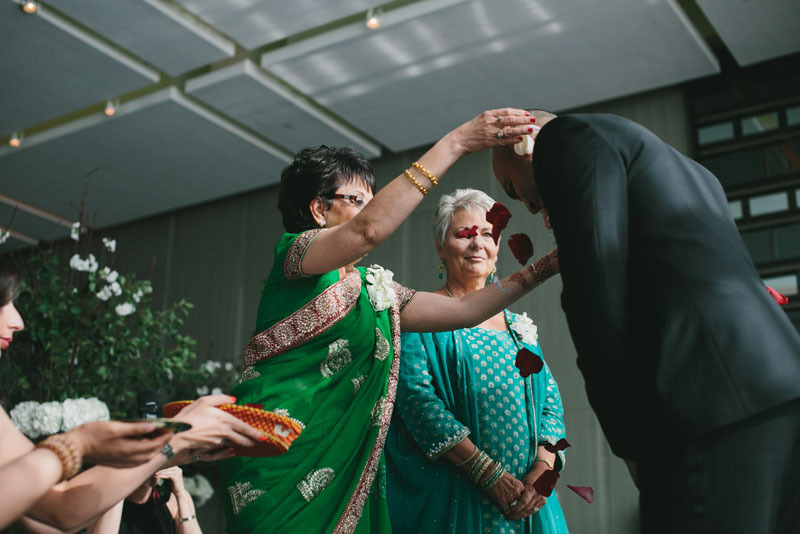 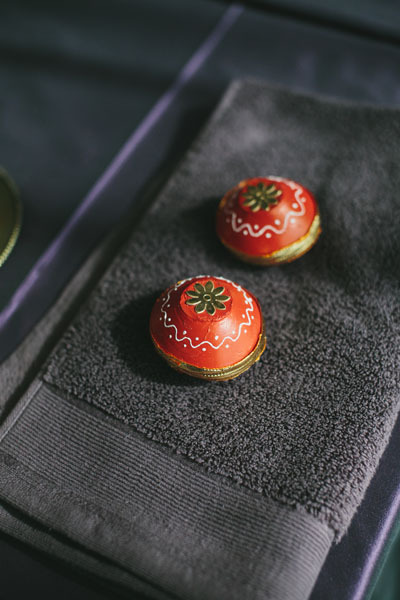 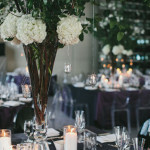 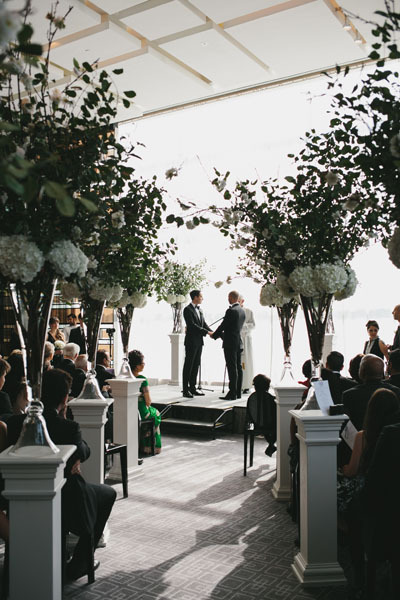 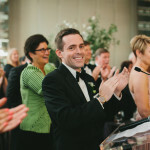 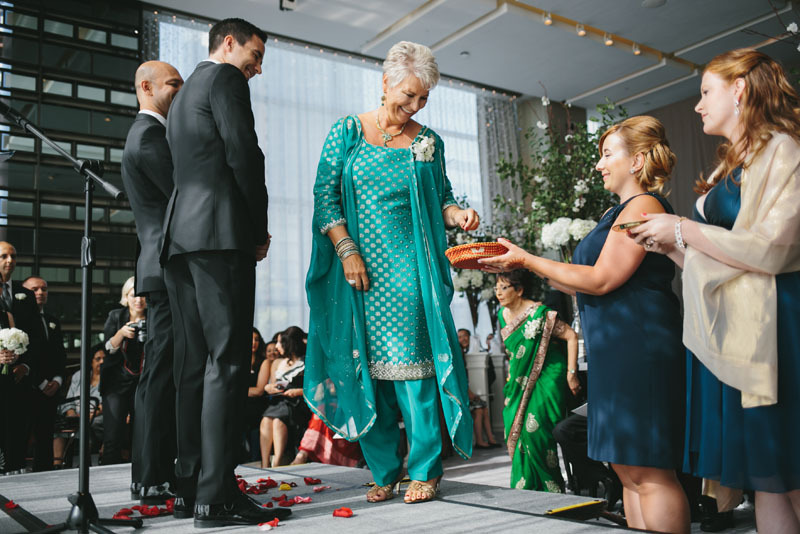 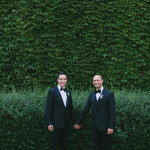 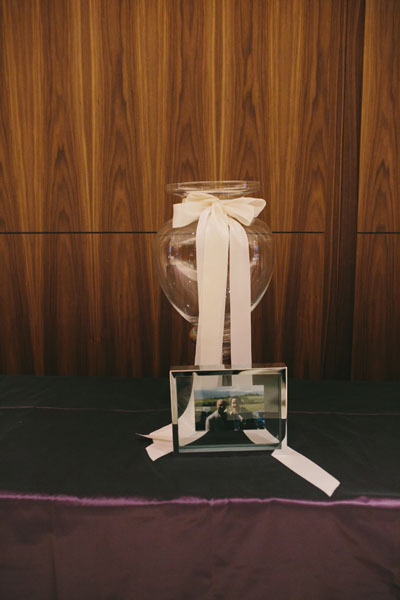 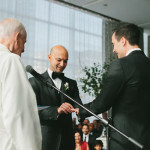 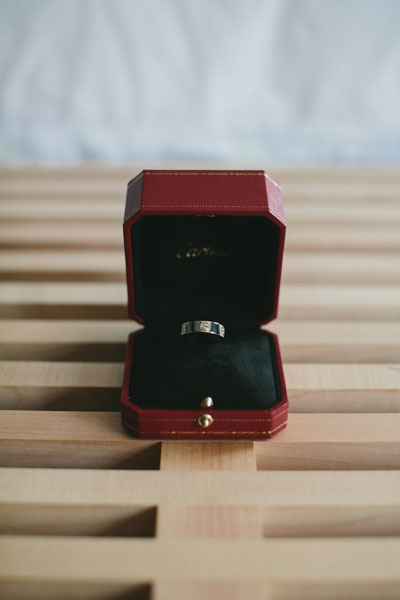 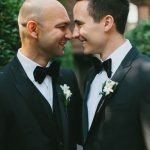 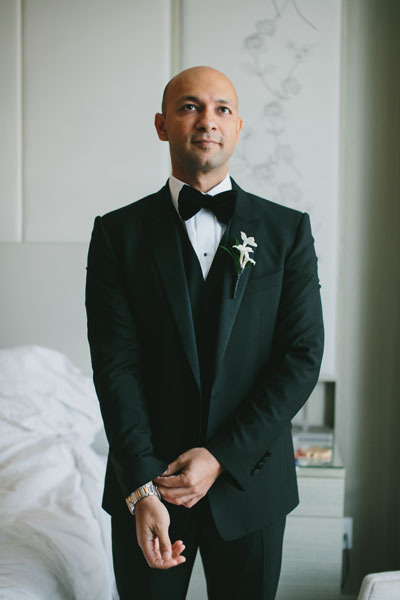 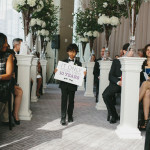 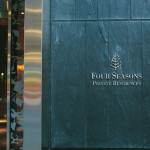 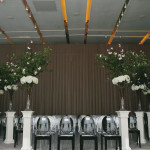 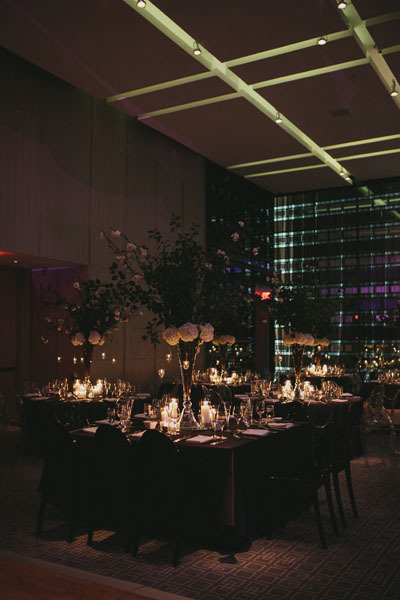 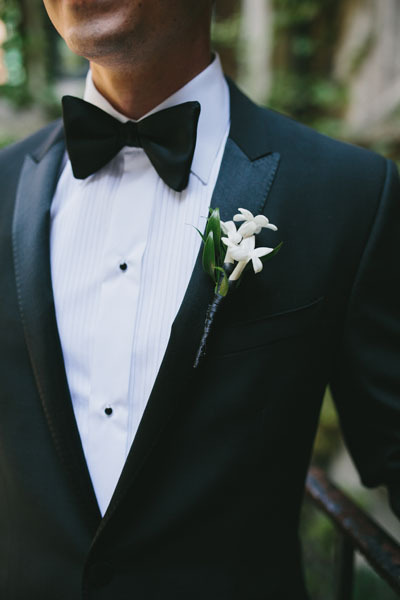 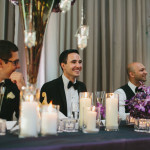 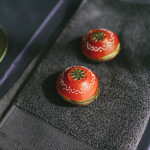 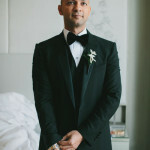 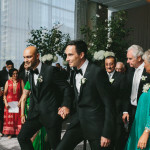 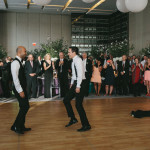 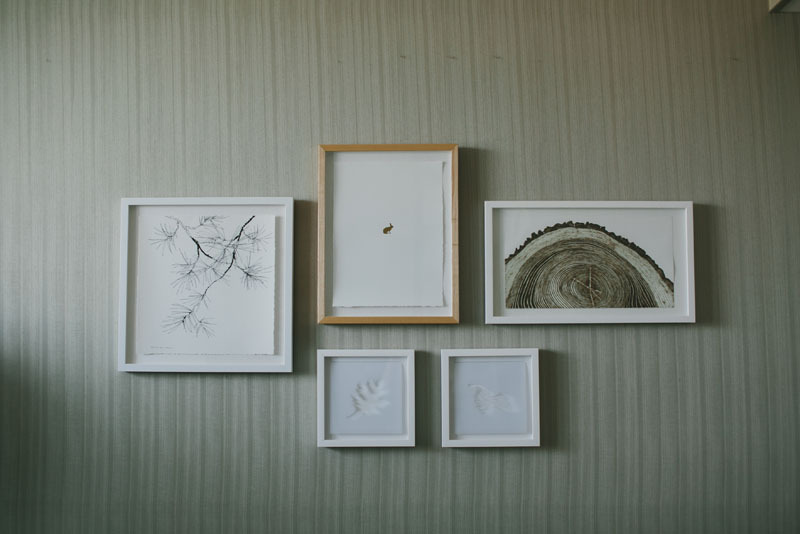 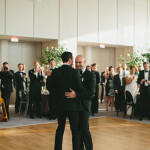 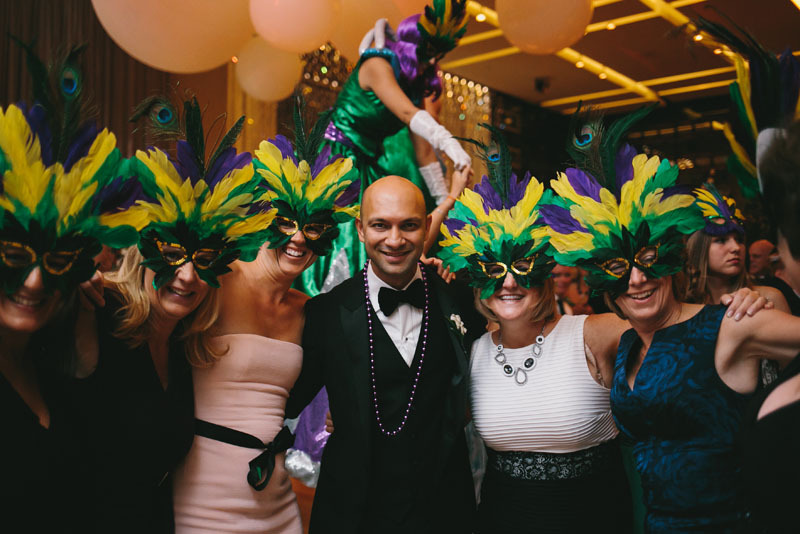 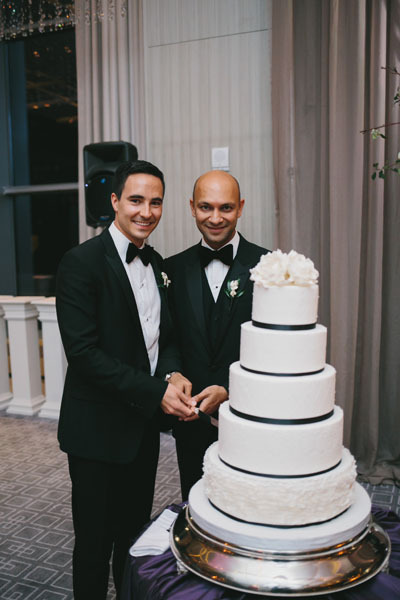 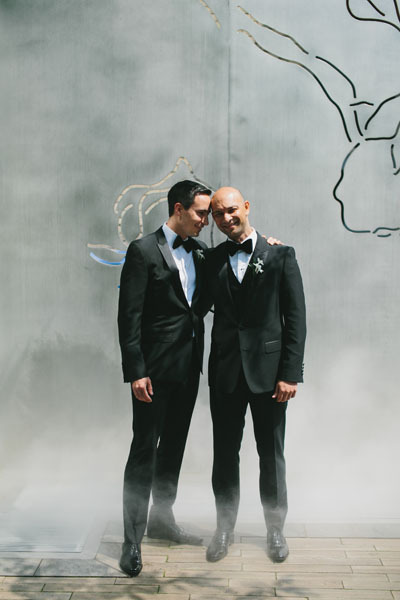 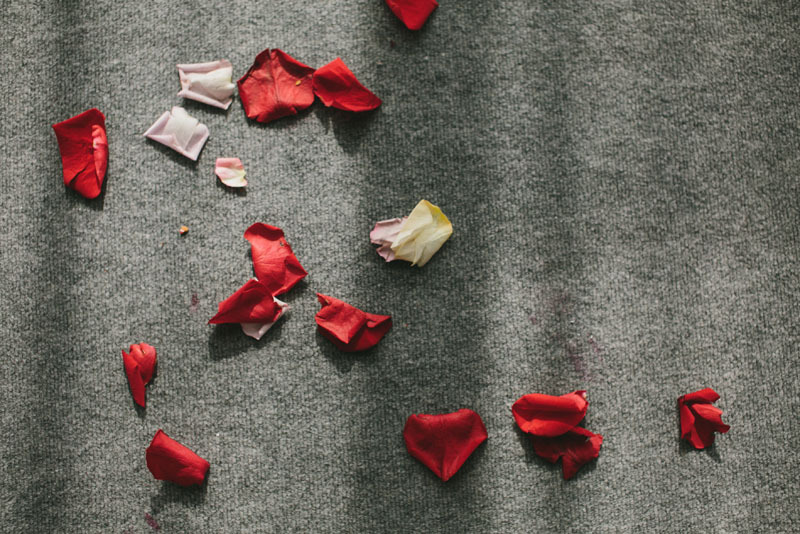 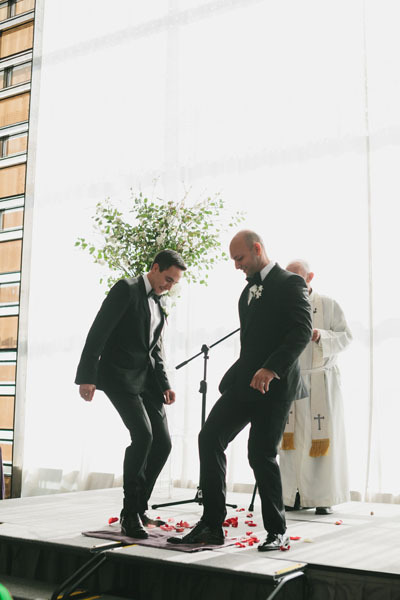 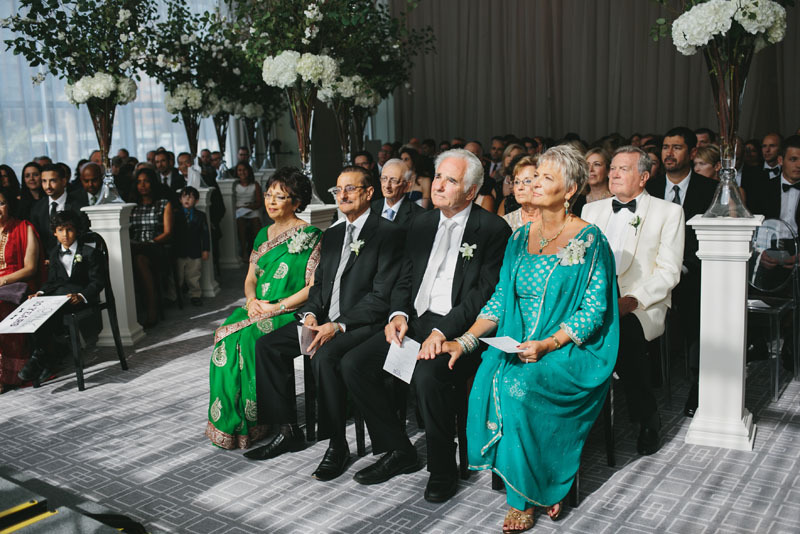 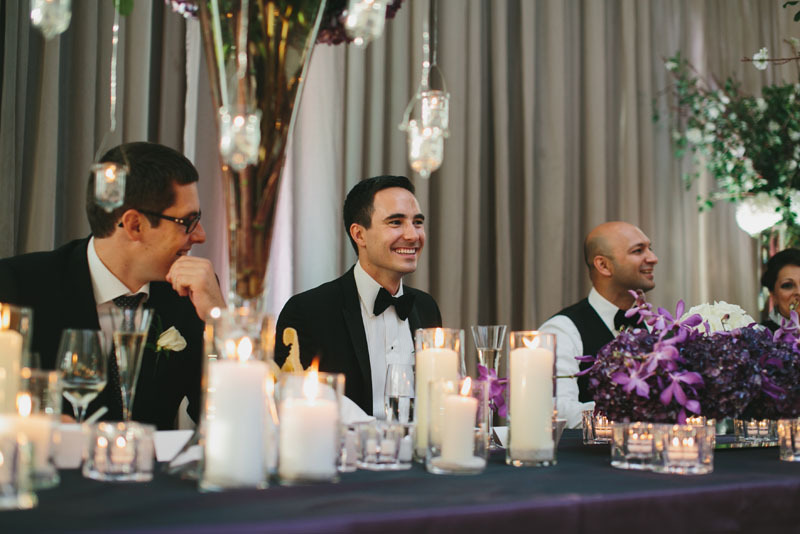 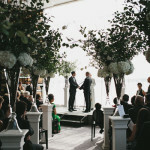 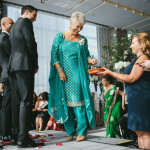 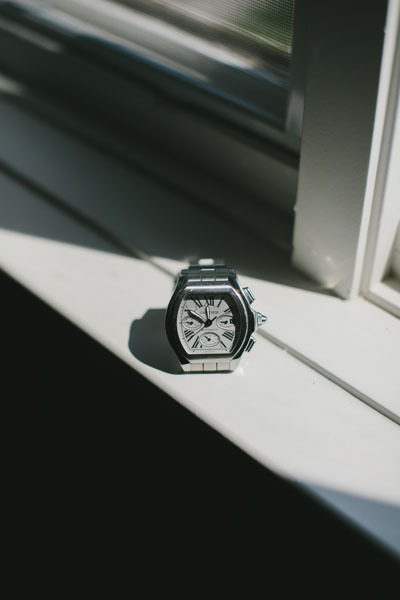 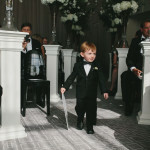 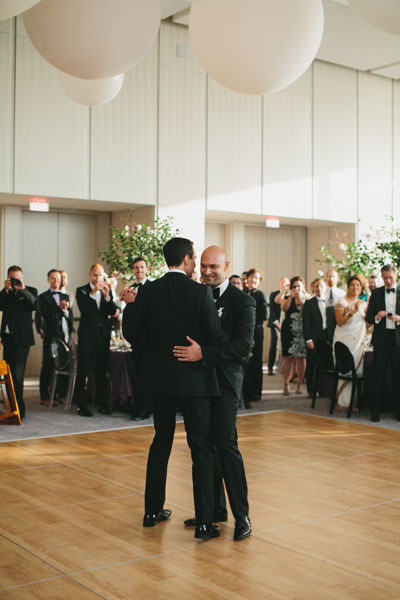 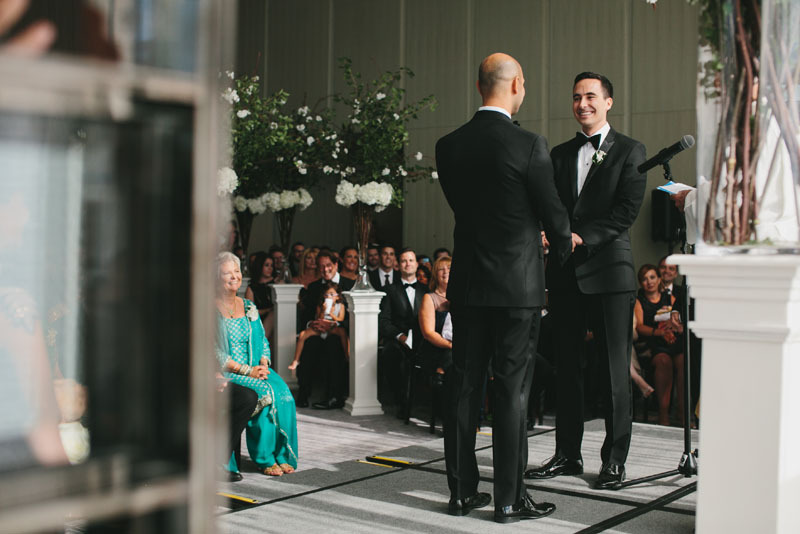 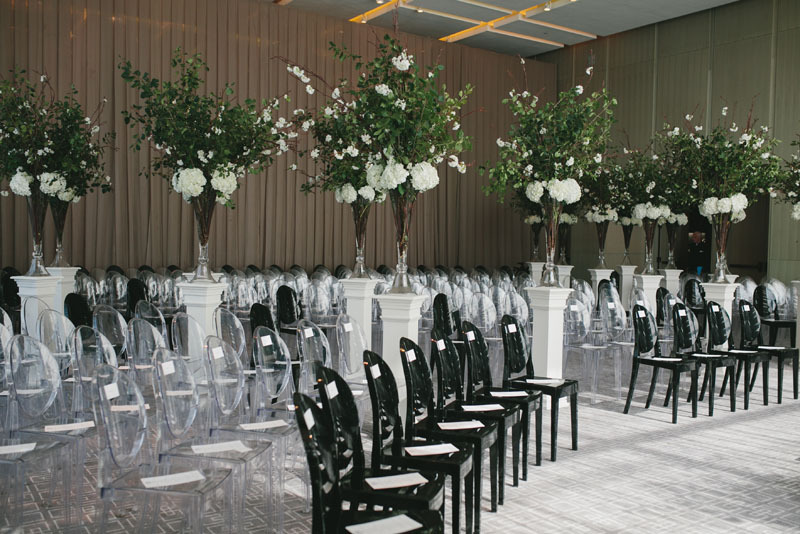 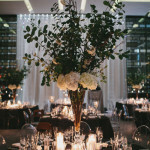 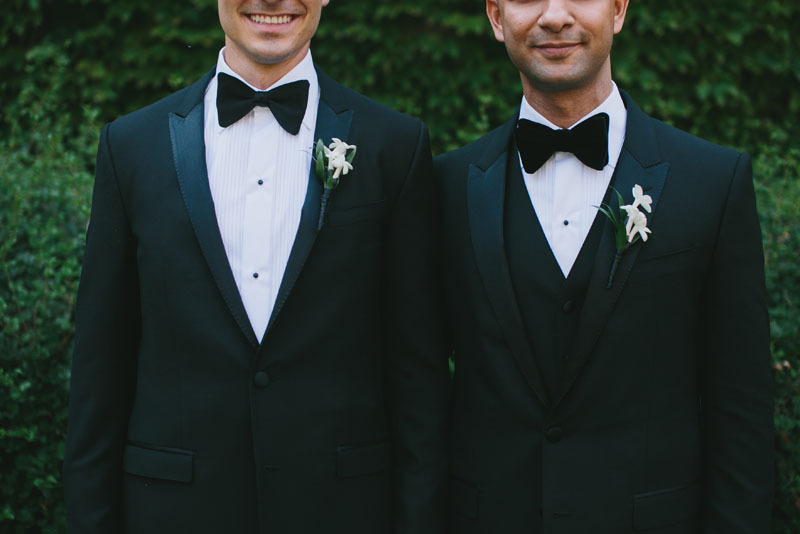 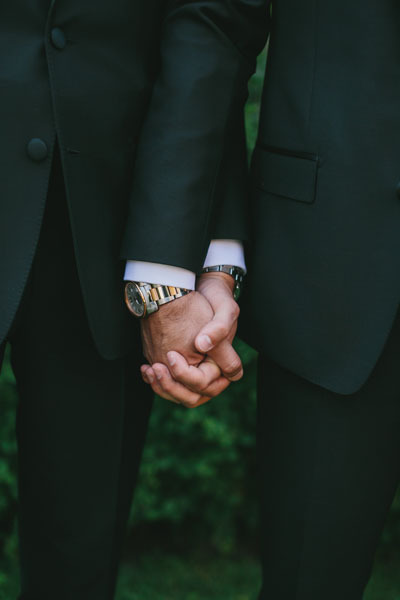 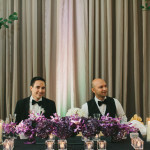 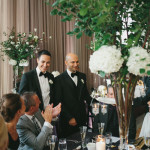 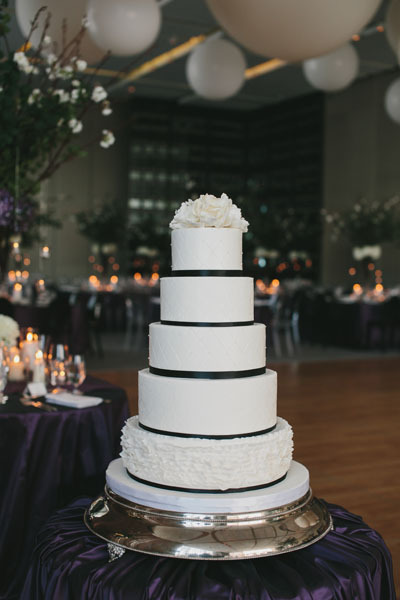 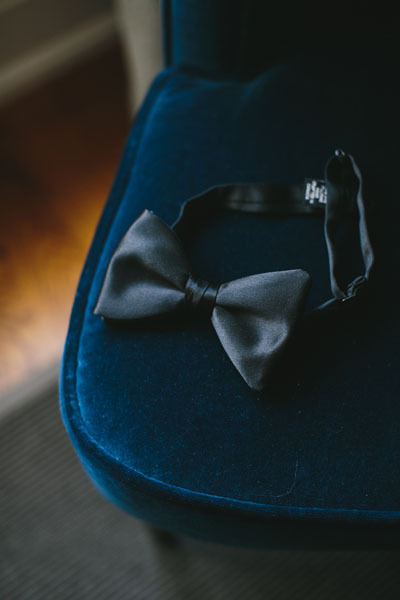 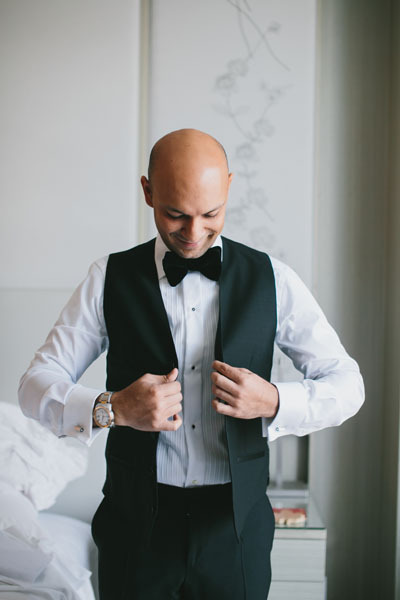 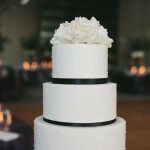 Their wedding ceremony and reception took place at the new and beautiful Four Seasons Hotel in Yorkville, almost exactly 10 years since their first date. 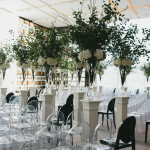 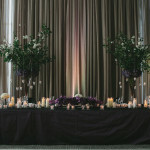 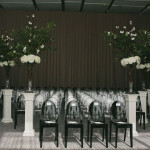 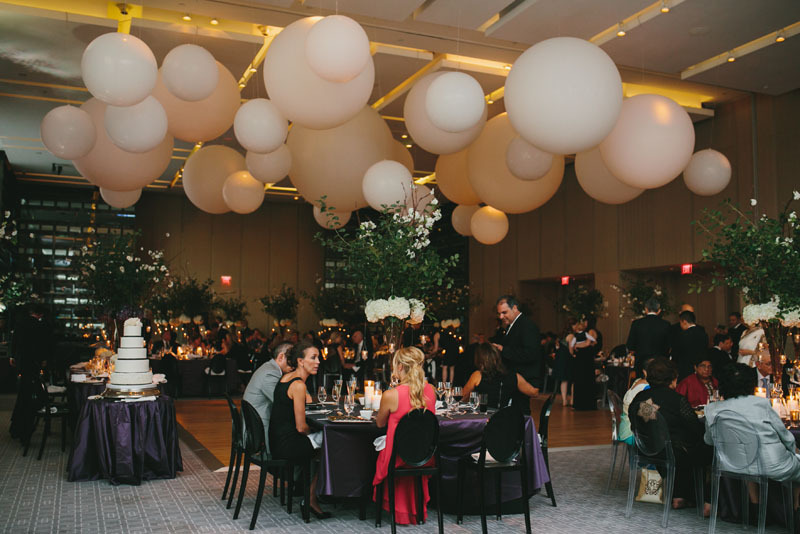 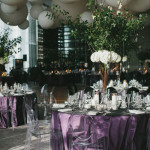 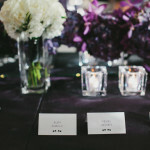 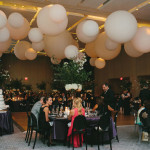 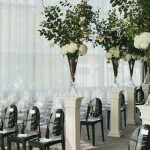 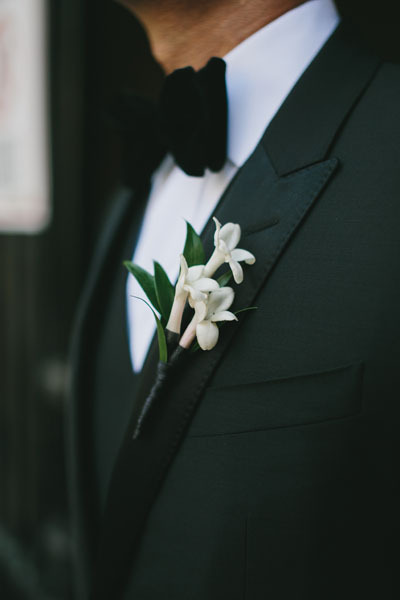 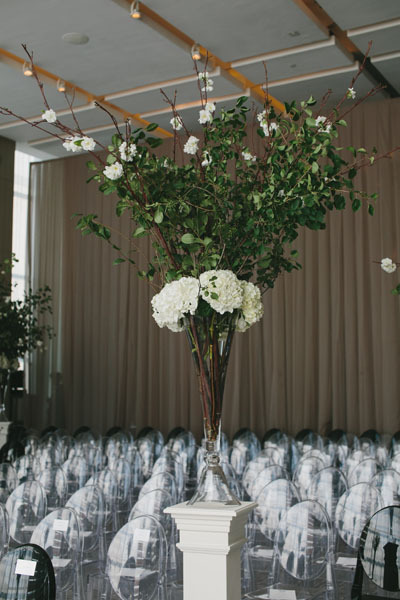 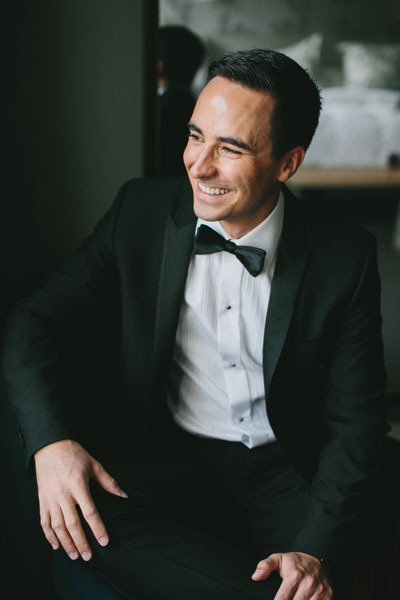 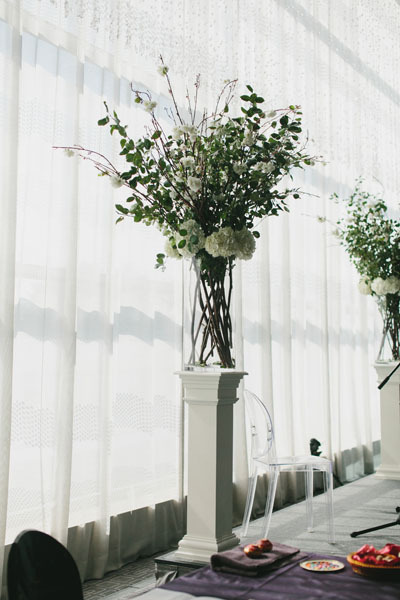 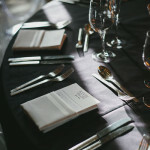 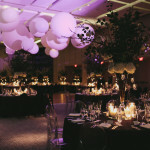 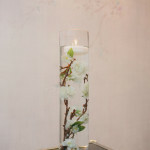 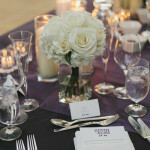 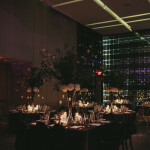 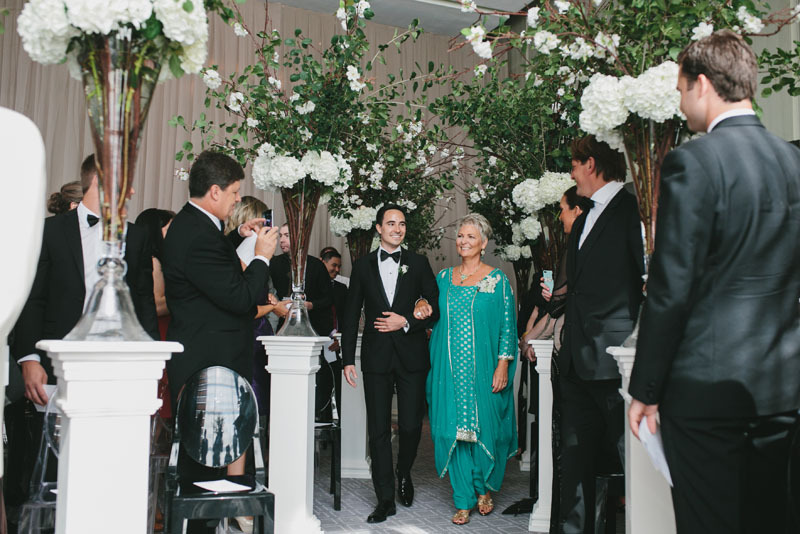 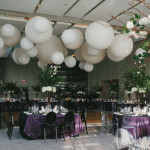 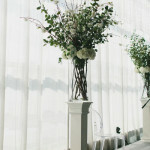 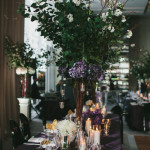 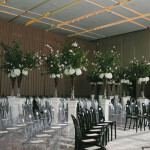 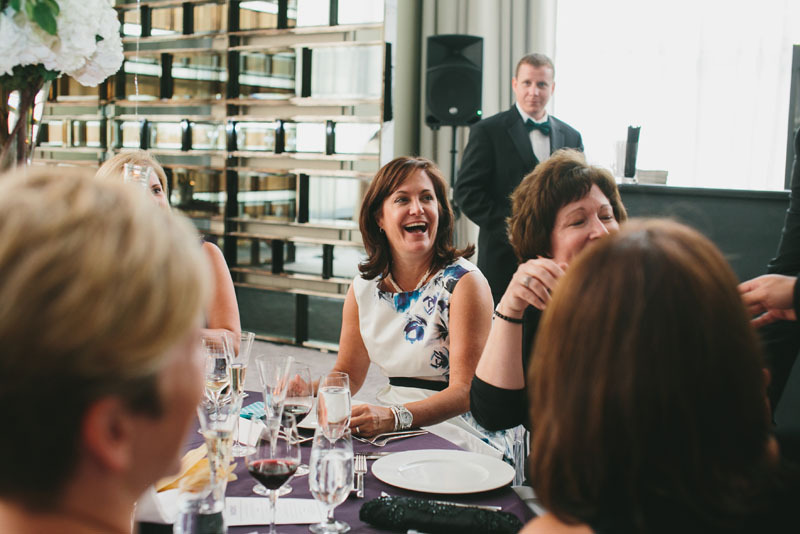 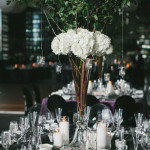 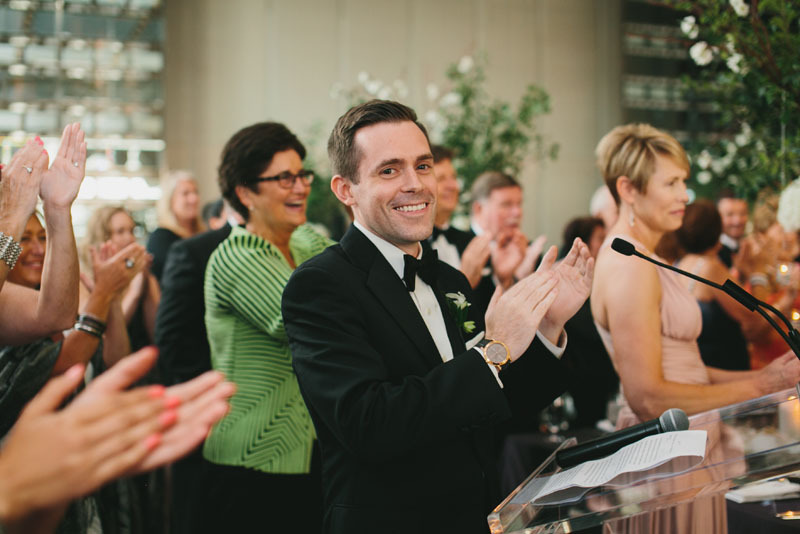 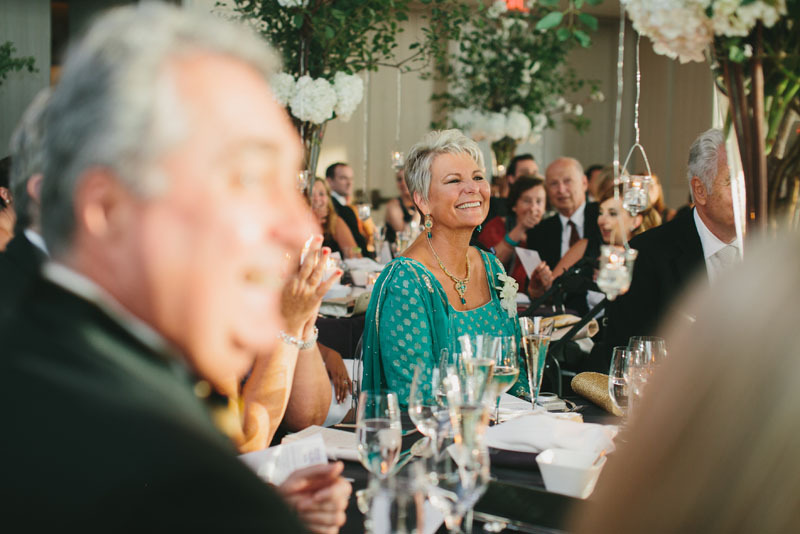 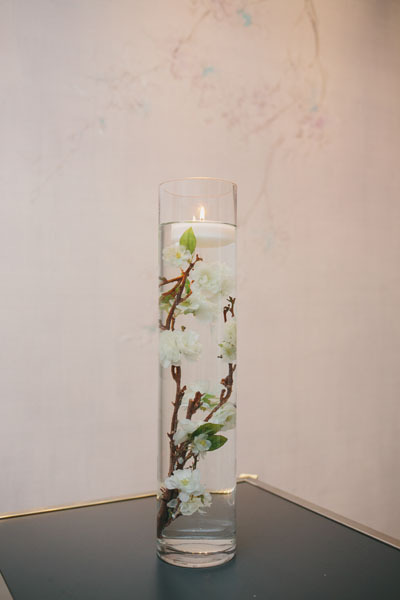 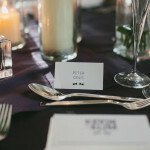 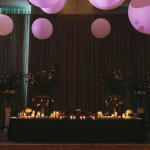 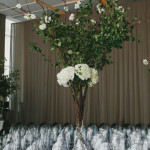 The wedding was outfitted to the nines, with Frank Rea from Forget Me Not Flowers leading the design team. 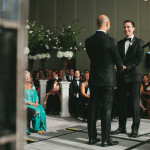 The ceremony seats were shaped in an arch for a communal feel, with the grooms walking in from two aisles meeting together at the front. 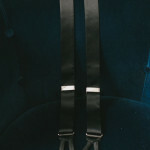 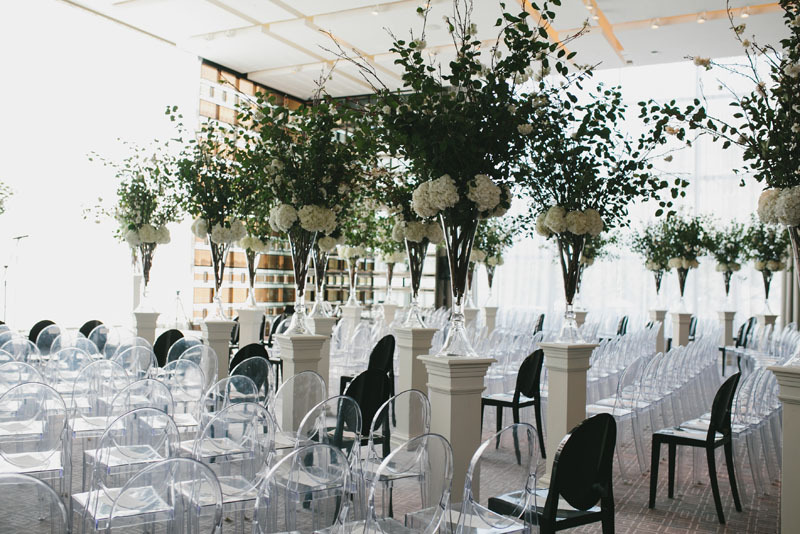 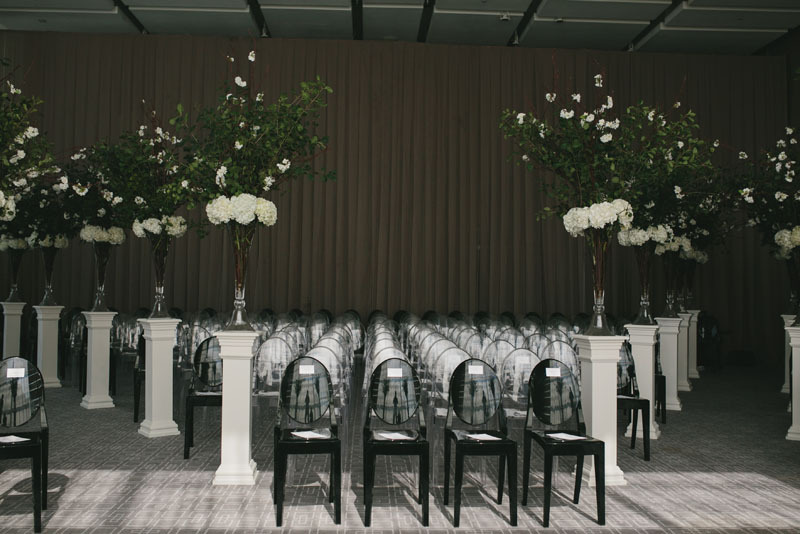 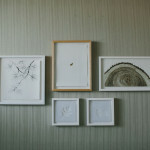 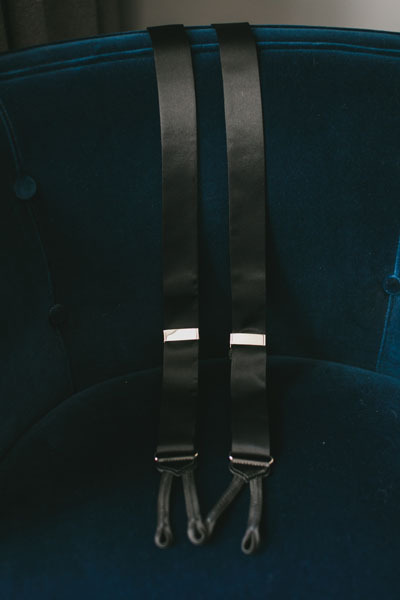 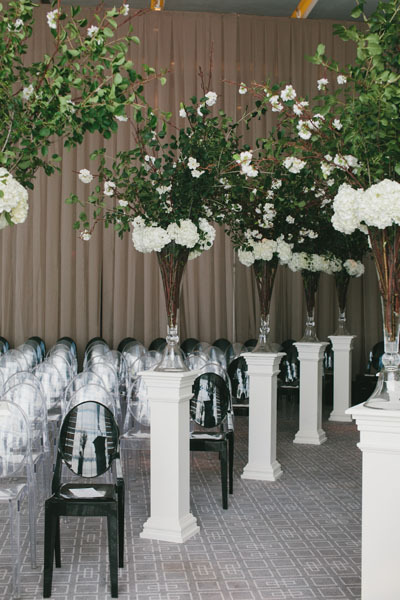 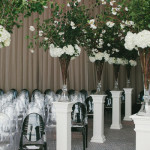 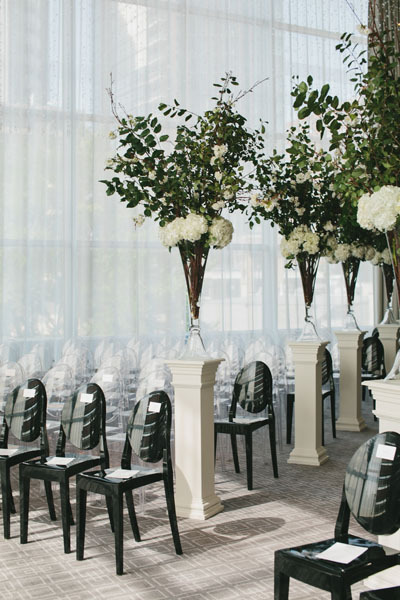 The aisles were lined with beautiful tree-like arrangements and graphic black ghost chairs. 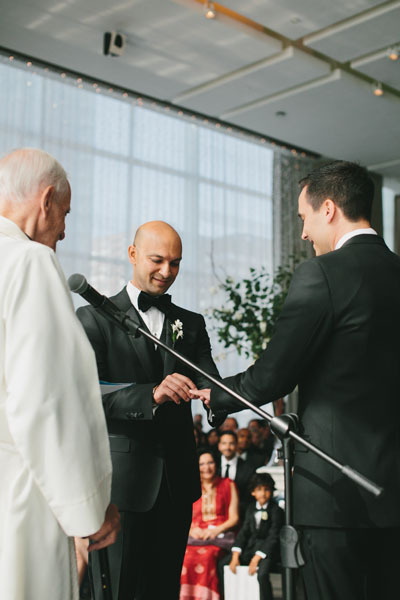 Their close friend Ian officiated their wedding. 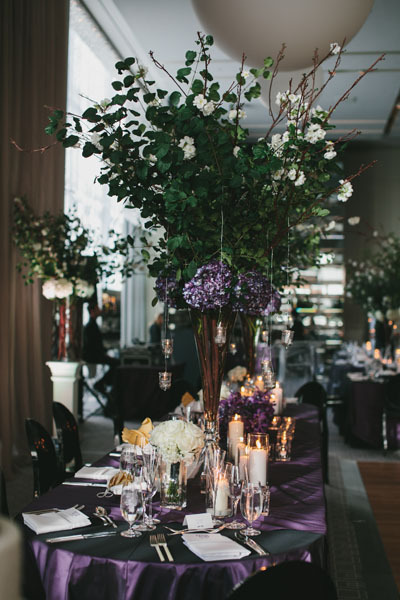 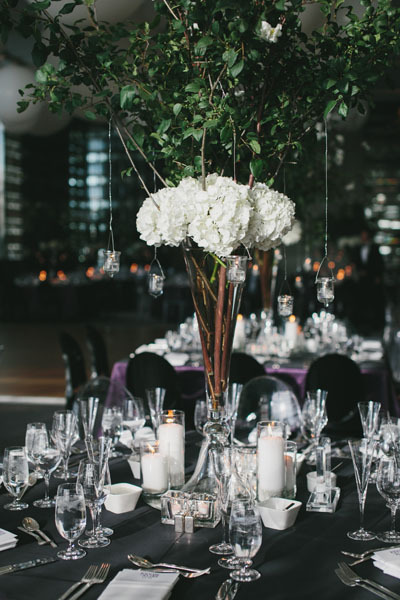 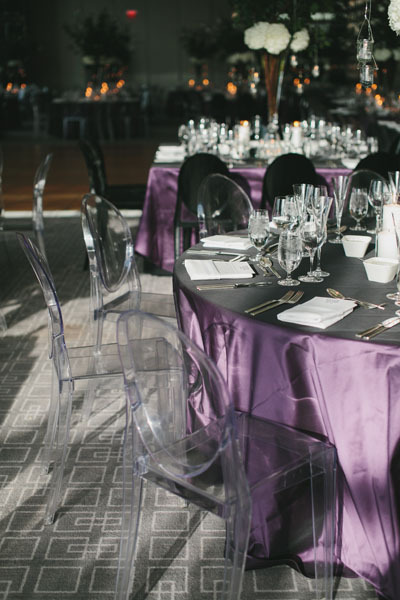 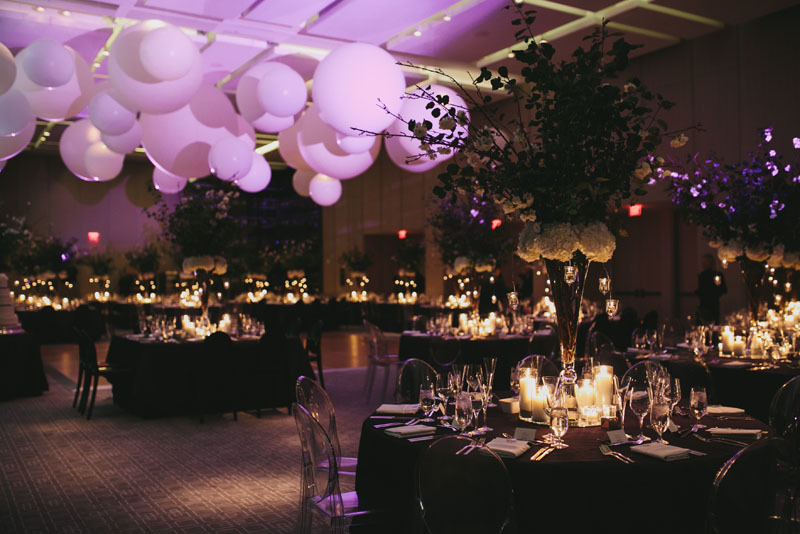 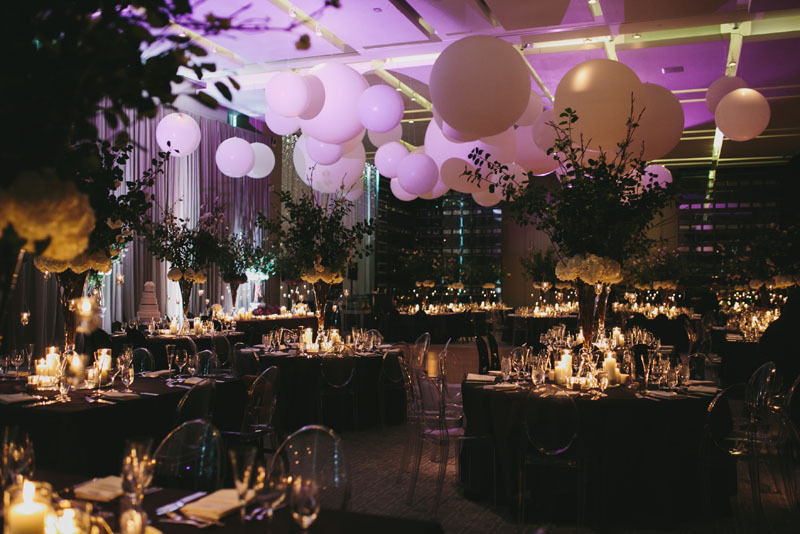 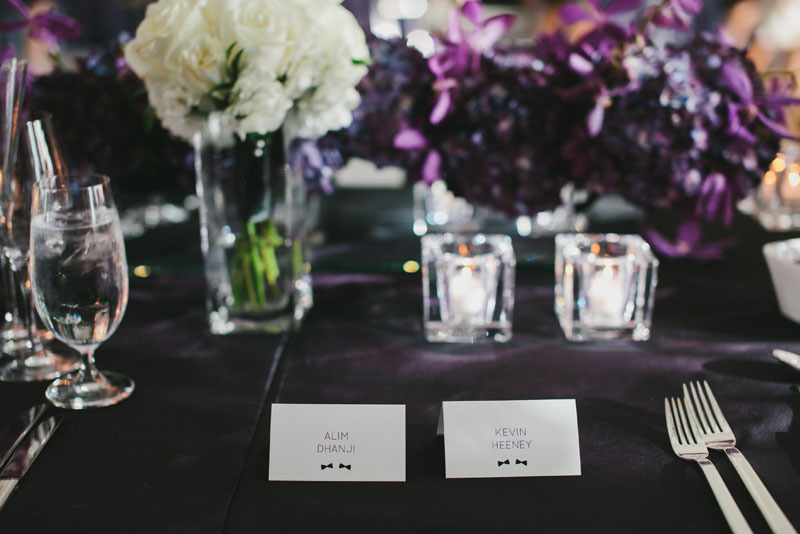 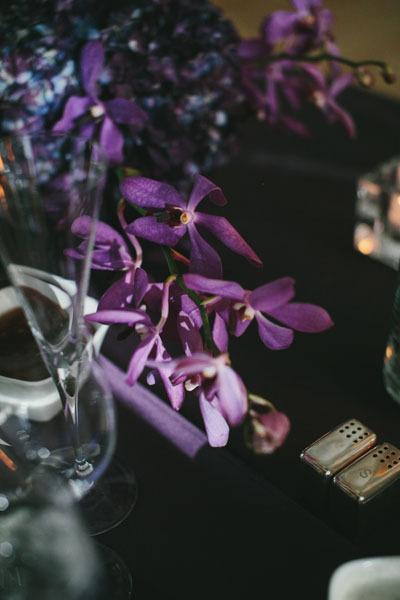 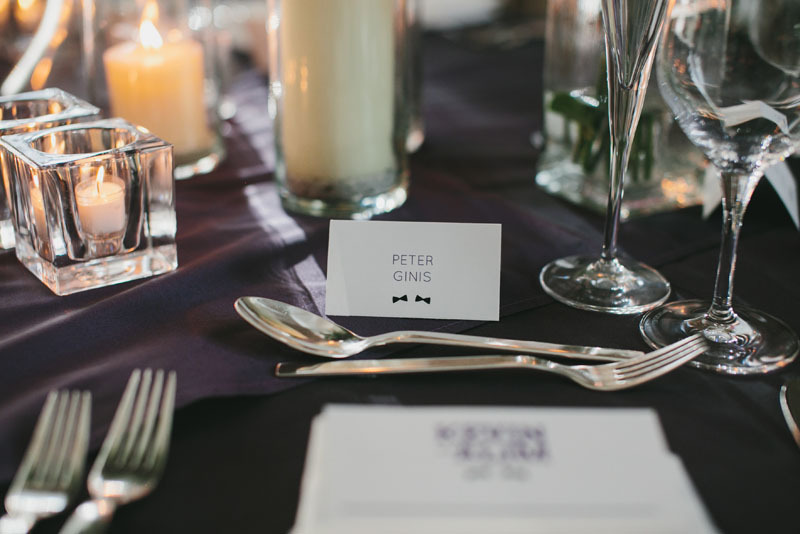 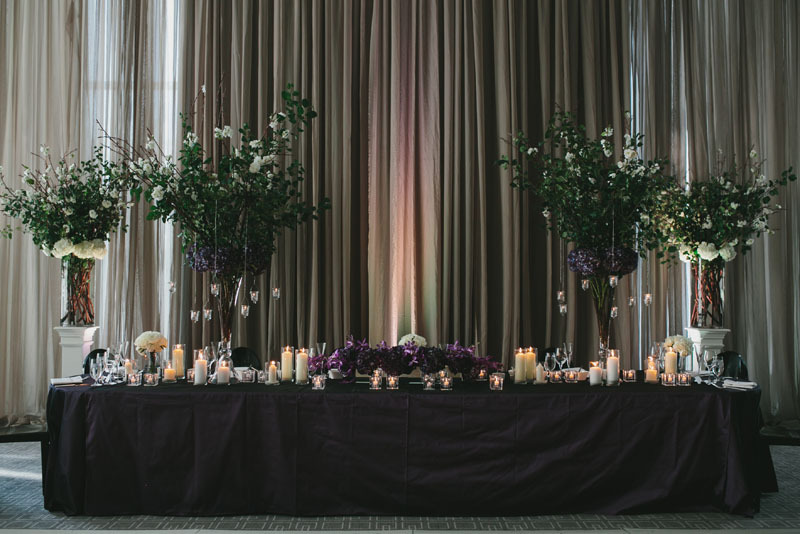 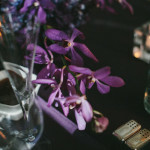 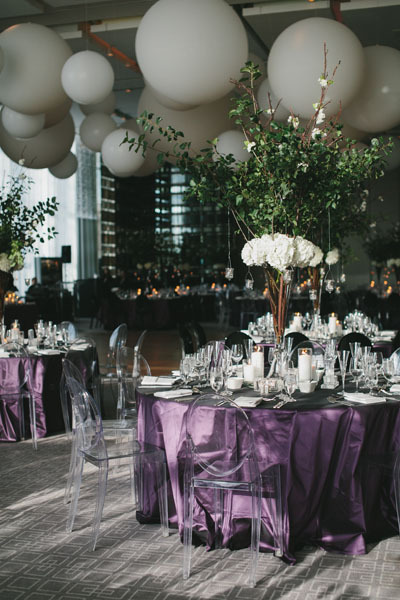 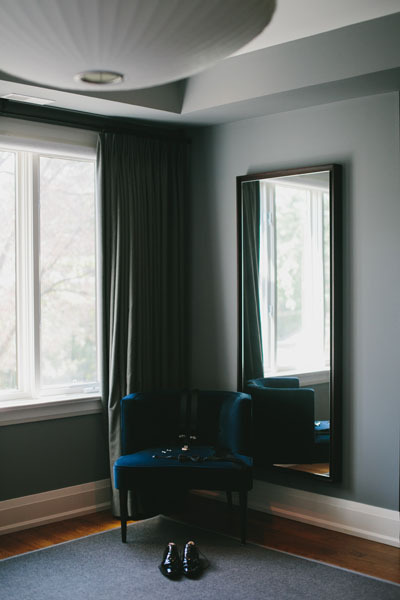 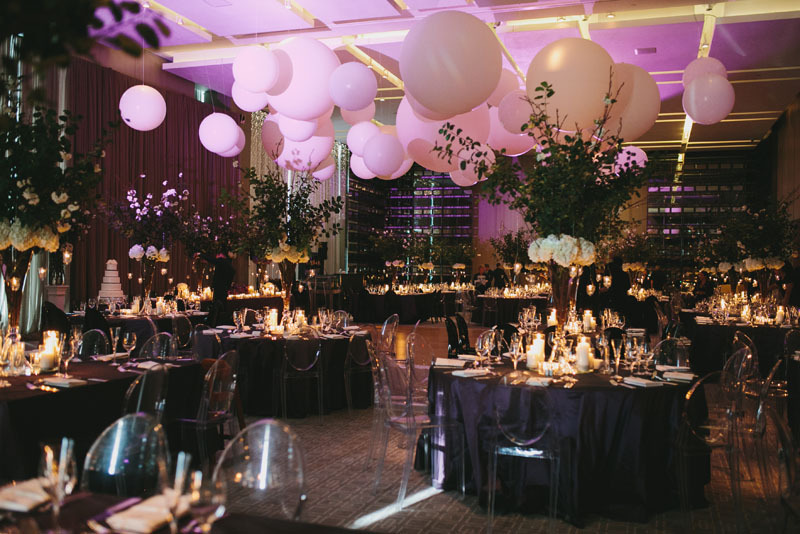 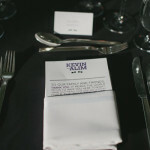 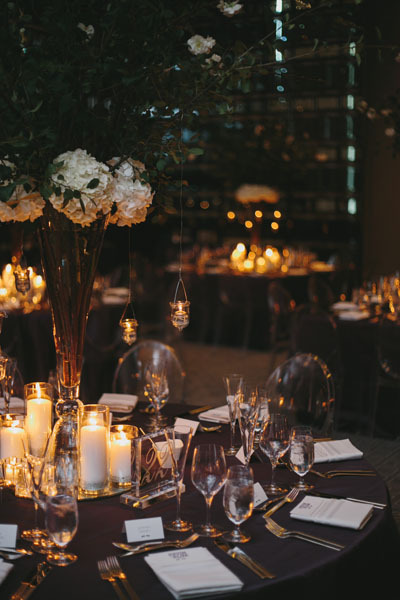 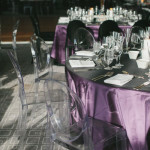 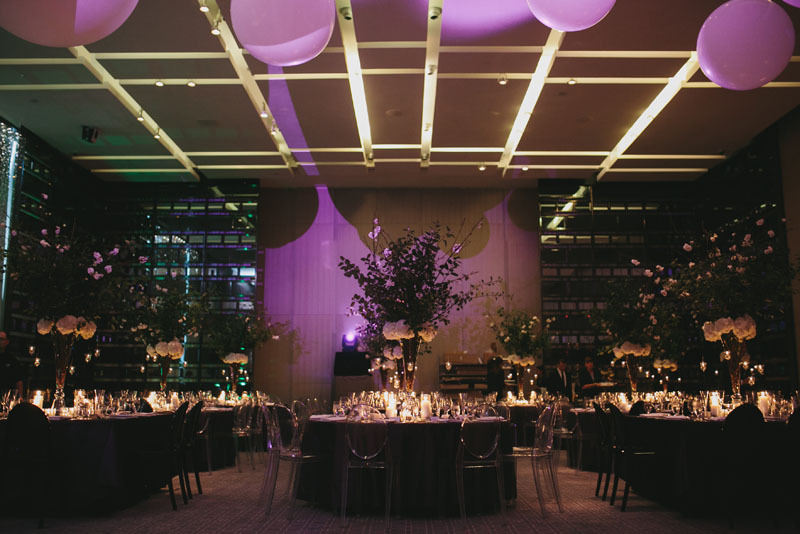 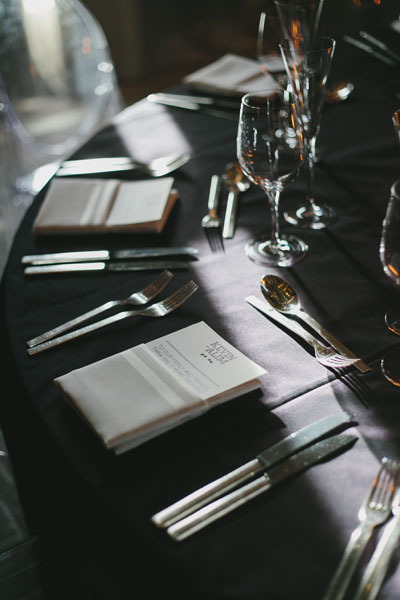 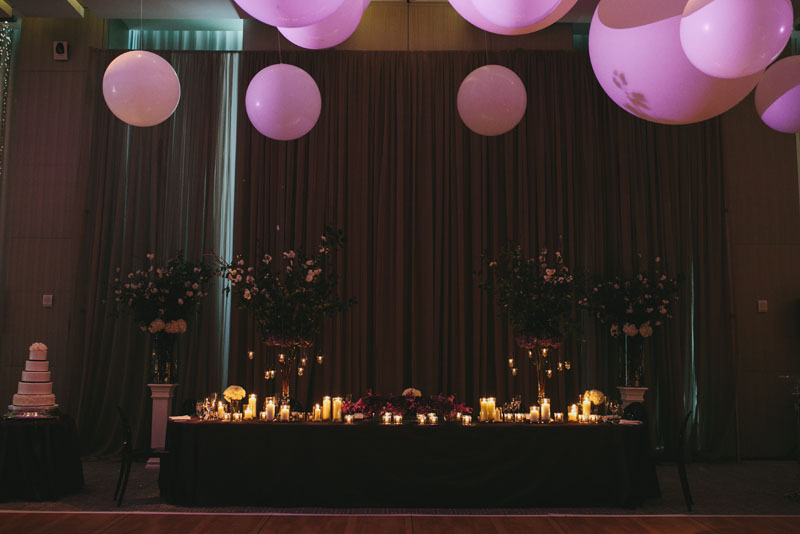 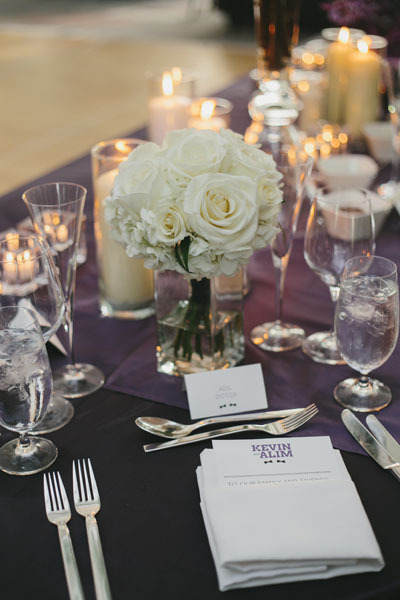 The room was then transformed for the evening, with their sophisticated palette of dark purple, black and white dressing up the space. 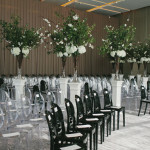 Alternating round and square tables filled the room for visual interest. 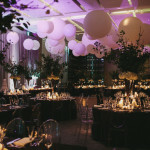 Guests feasted on a family-style meal underneath a canopy of whimsical tree centerpieces adorned with white floral and hanging votive candles. 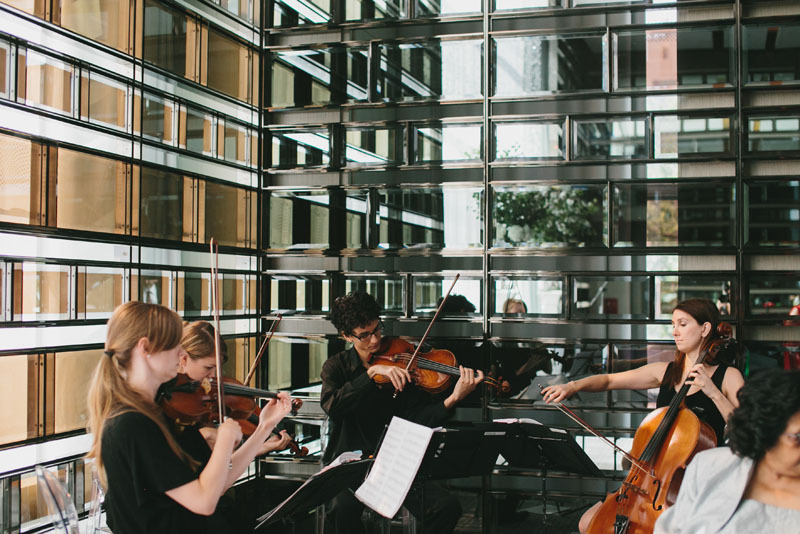 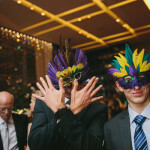 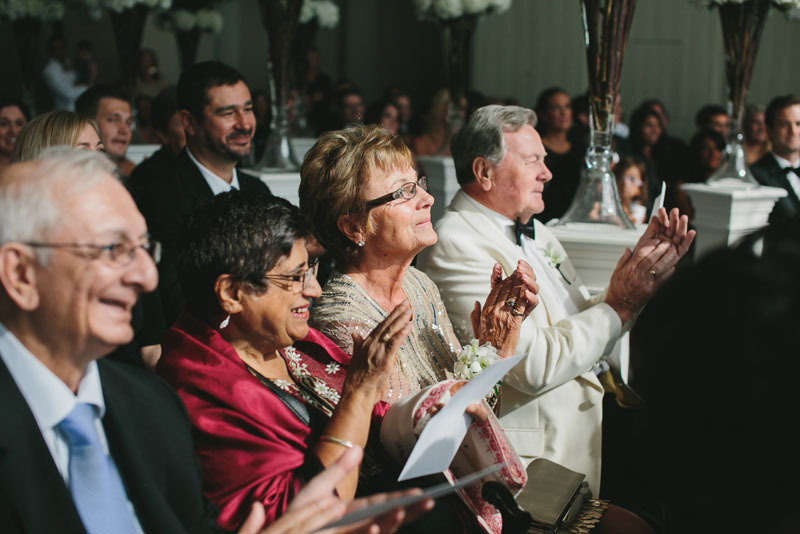 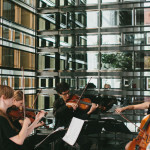 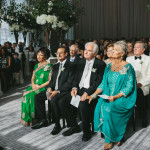 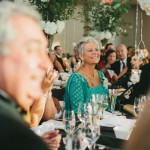 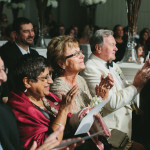 Beyond the glitz and glam, it was a fun and personal celebration, with their families coming together for a historic tradition of serenading the newlyweds with a collaborative song. 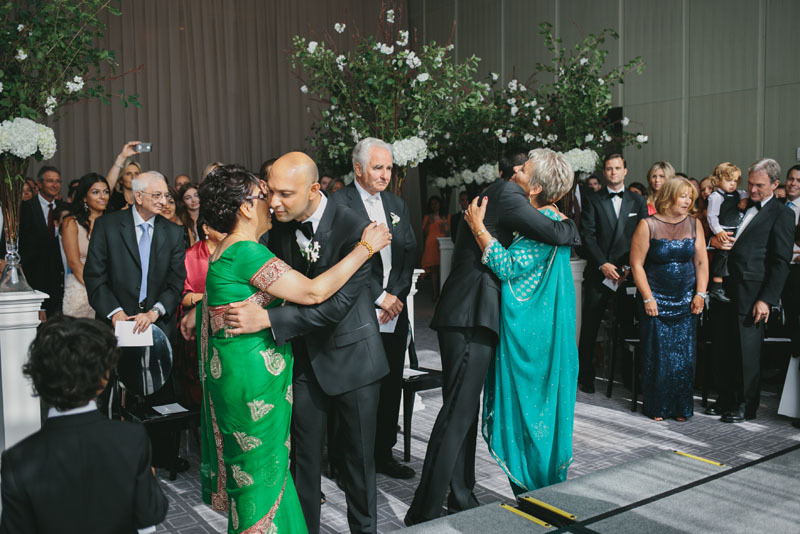 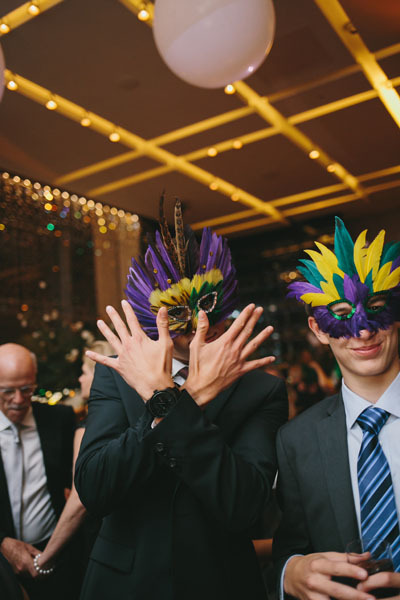 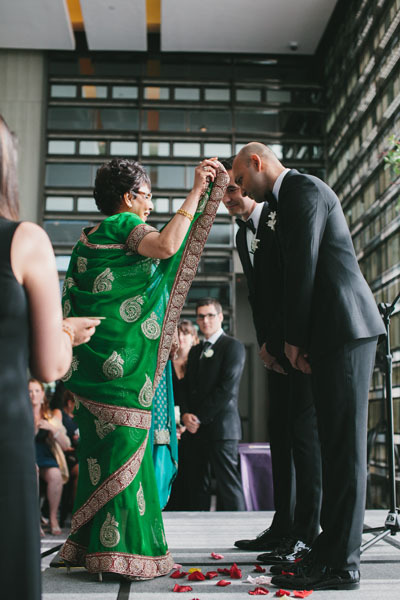 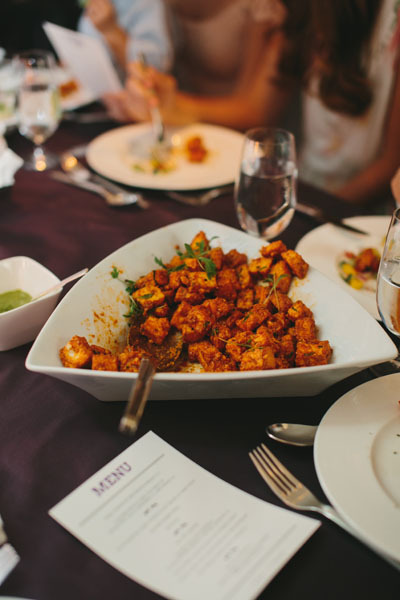 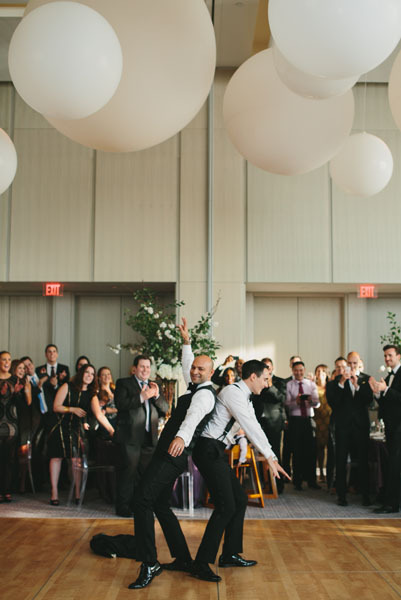 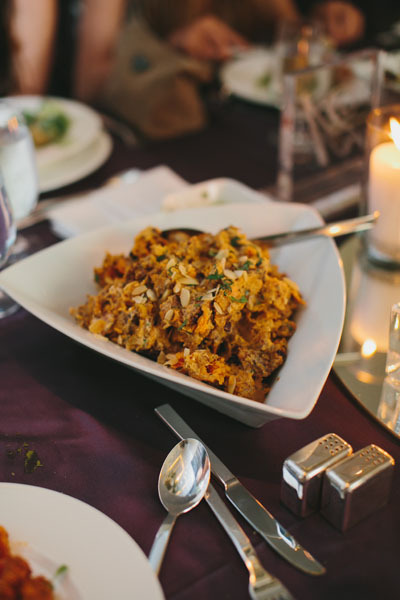 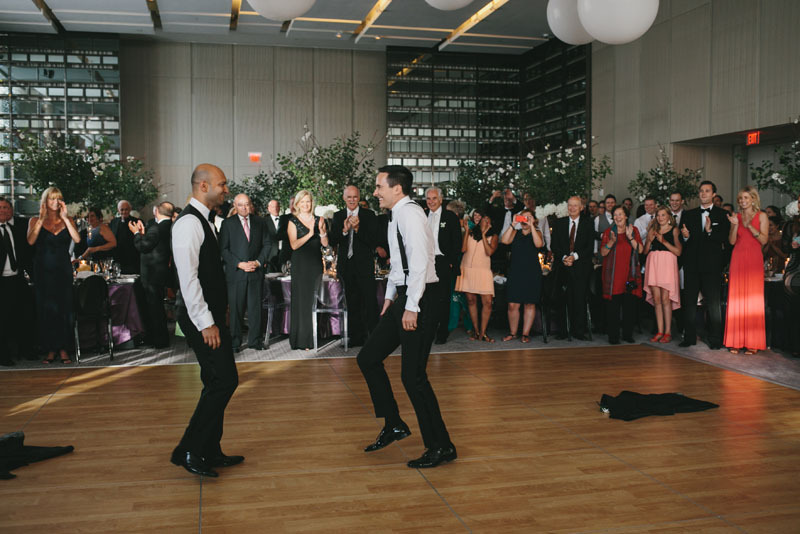 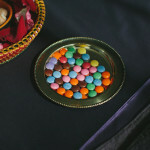 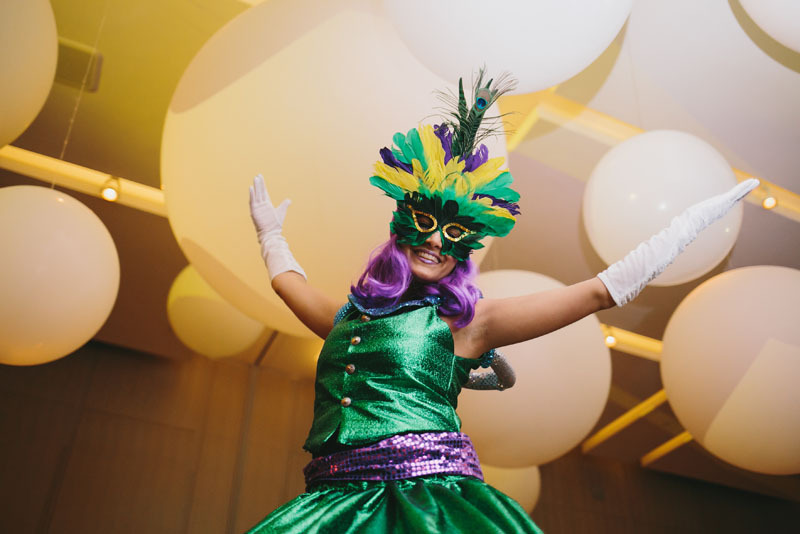 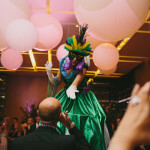 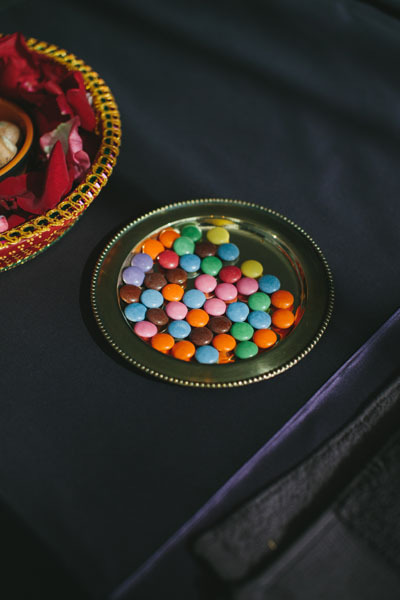 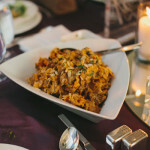 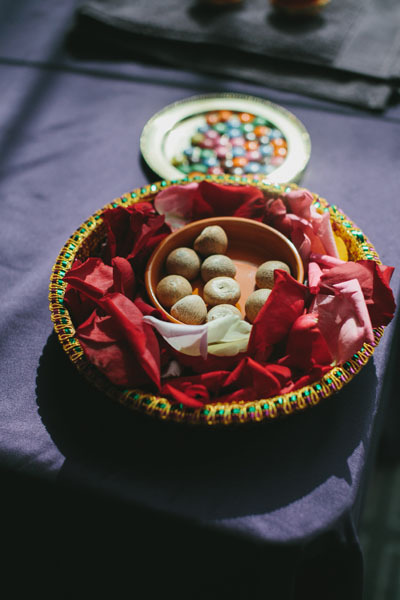 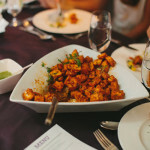 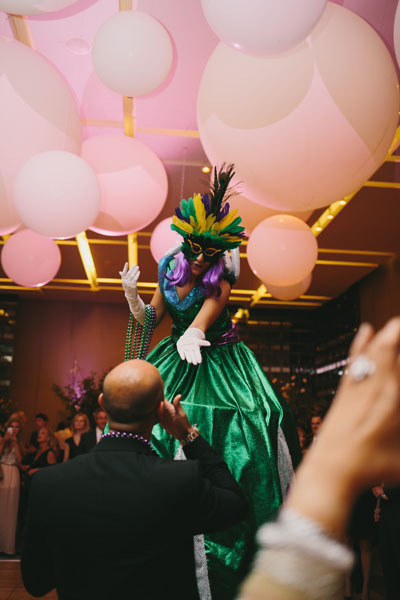 The couple also surprised guests with a memorable first dance that turned into a fun Indian-inspired dance routine.